Melanin Bares Unimportance If…? Unity Bares futility! Ideas… ideas… ideas… does produce ingenious plans… I know this personally from technology and experience! Forceful measures are forever temporary! Temporary neither fits the framework of prosperity… sustainability, literally! 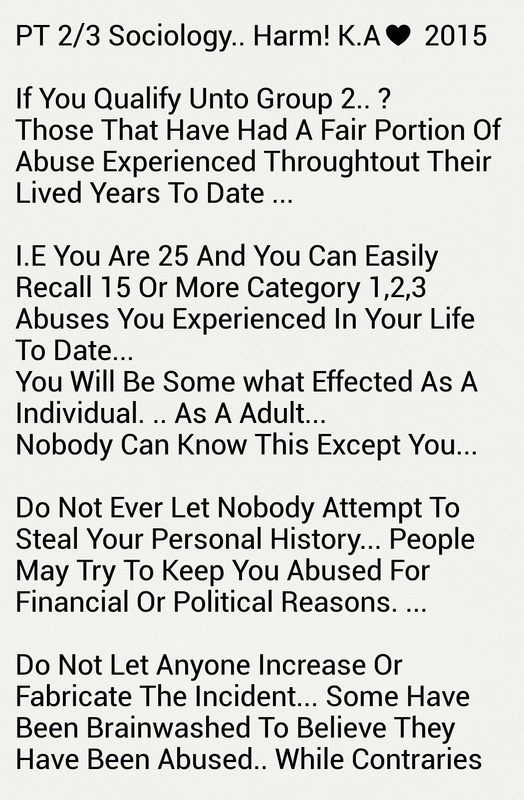 Many afro-Caribbean/African blacks perpetuate good advice upon the unfortunate nonchalance of the niave… the young, the fashionable and of cause the ignorantiquity of the majority at large! 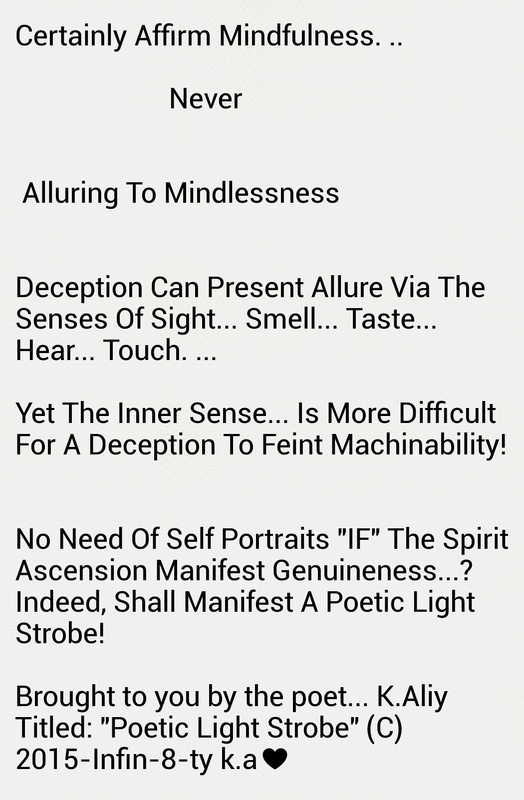 This subliminal affair has not altered the afflictions of the black race… from antiquity to present.. The subscriptions to turmoil are as ever present as they have ever been.. 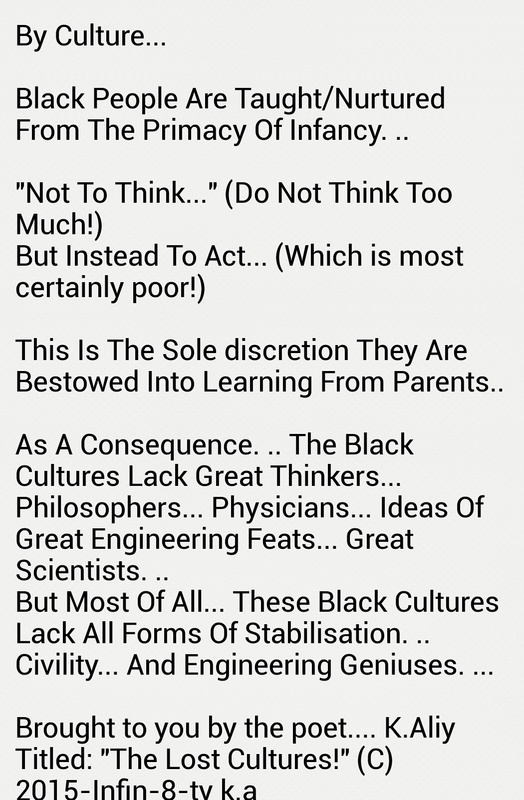 Many would affirm, “turmoil in black life’s has forever increased”, in which I would agree! The mining of our minerals is slowly killing our true life force… (the life force is none other than the veins… arteries… subdivisions of a complete organism cooperating the ingredients as a magnetic unit or pulse wave) The life force sends out the preferred ingredients via the reciprocal default chanel set for all corresponding mechanisms to retrieve! All organs/organisms in relation to a higher organ/organism are its relative intrinsic subdivisions as we have explained in earlier chapters! Just as the lands, seasonal climates, agriculture, oceanic masses are the subdivisions of the mighty earth… as in relation to a much bigger organ than the earth… the earth is also a subdivision component of the galaxy! The galaxy is a subdivisional componentary of the universe! 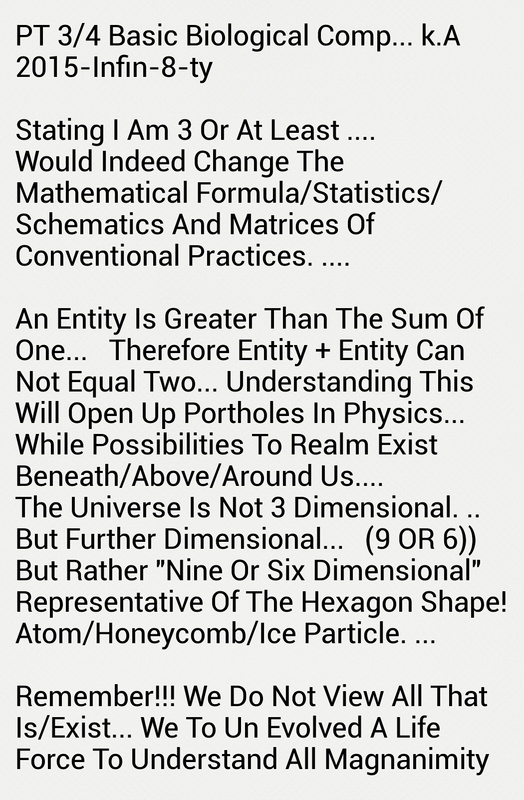 The universe is alooking a subdivisional componentry of a cluster… and clusters are subdivisions of even larger comprehensional numbers of space componentry… Yet eventfully… lyrically and practically we reach the mighty cosmos as a complete sypnopses! 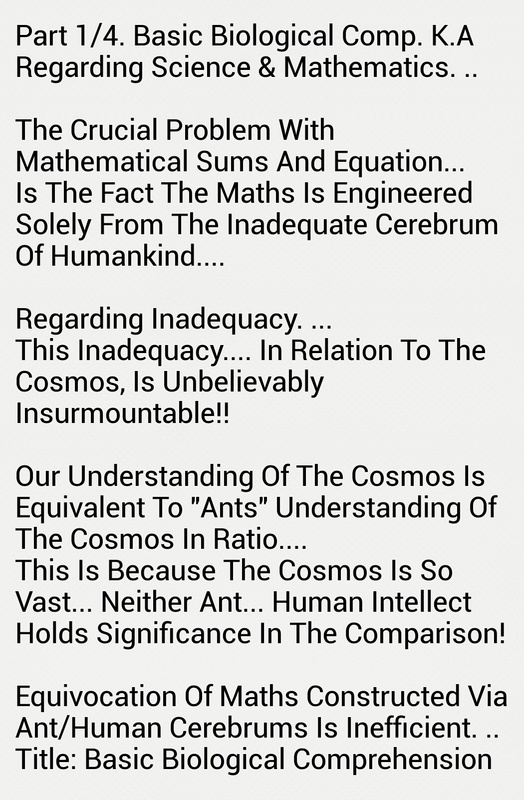 The mighty cosmos as a complete synopses is a seismic organism, of omnipotent proportions! 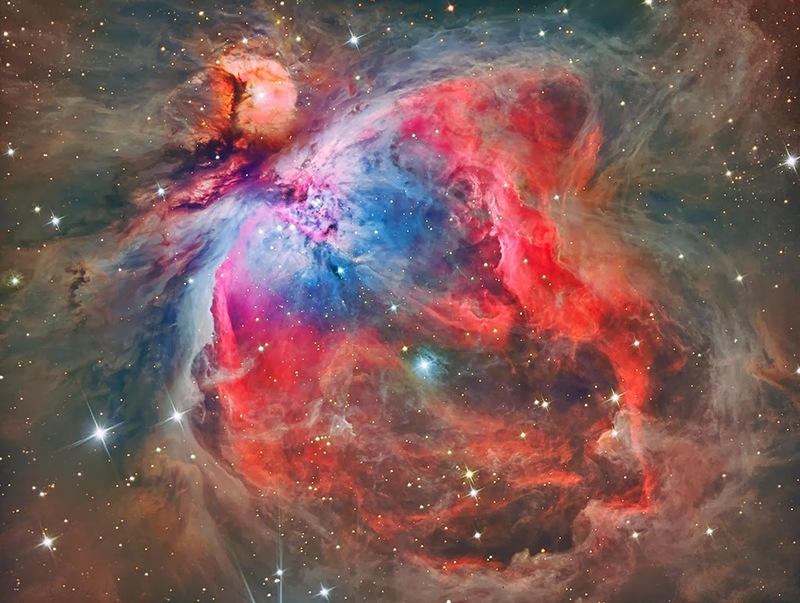 I shall not delve our minds further than that, of what lays outside the mighty effervescence of the organism the cosmos! Earlier we stated on this blog post… the title: “Melanin Bares Unimportance If. ..? Unity Bares futility! The colour of our skin tone, even our accent and place of ethnic origin as well as birth land, will not weigh as any such importance… ever… if we the people of colour are not wholeheartedly United upon a paradigm of prosperity… mindfulness… in all aspects of personal… private… segregated/integrated and international peace… harmony and autonomy! So you can comprehend if the complete synopses of a organism’s life force dies… well than all and every single subdivision everywhere dies with it! This be the true ritual of existence! It is this very group who are indeed the real pioneers and scientists of humankind..
To study is to be scientific.. to be a scientist… a physician! 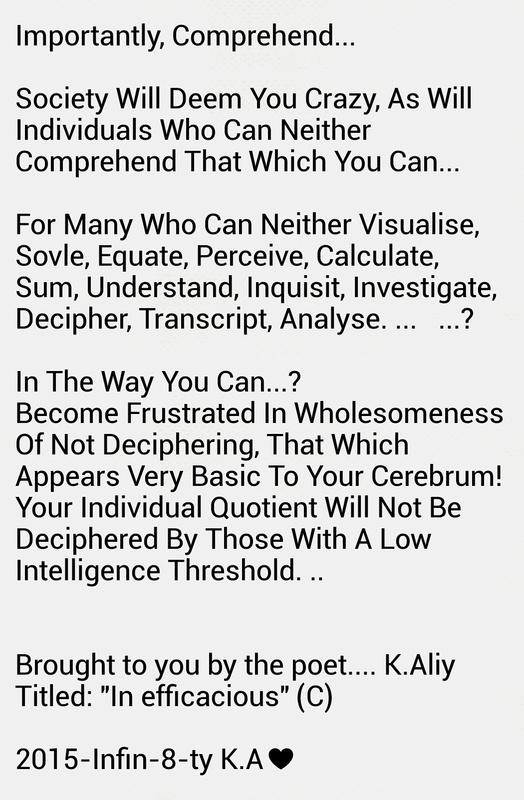 I myself… I indeed am a scientist… though I am not qualified to practice under the law of certain sciences.. though I can with other known sciences… I have studied perpetually and lyrically multiple fields… wherever I can… whenever I can… without compromise or persuade/disuade/suede reasoning! The first scientist were indigenous inhabitants which evolved into humanoids… their commencement through thought, of harvesting food for survival… these inhabitants learned the craft of food science! Then became competent while preying upon their prey… catching their prey and preserving the carcass… endorsing the capture with a significant ritual or dance! Which embodied the theme of their culture! When these minerals left Africa. .. so did all other attributed services related to these minerals… hence the intelligence left and exchanged hands for European shores! The tragedy exists as the natives was not privileged to know this information… in full… some knew of the powers from scriptures handed down… some did not understand… while others were nonchalant towards their gifts (super powers). We understand now that any people born into a special type of wealth do not/can not/appreciate that wealth… untill it is removed for good! 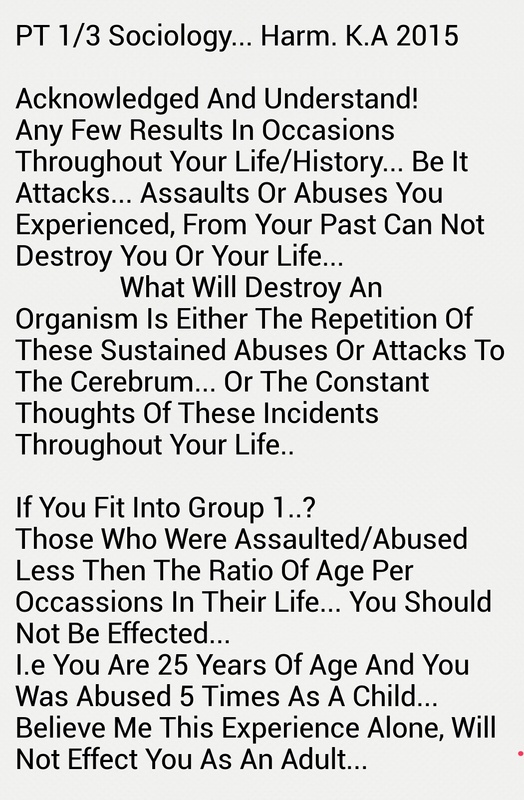 The black wealth was rather the crucial significance and ingredients of the hidden powers of the wealth… which is none other than the minerals of magnanimous healing properties… which became lost to the blacks via good will and innocence!!! It is not right… for they should really be in the poverty we are in now… (they know this) our minerals for our genome! Not for our luxurious spending! Only those special minerals can bring health to where it suffers most! What Lingers In The Advent Domain? Not to delay further upon another second… we shall initiate here and commence… from there in, with what we left of in the previous pages… on this special topic! There exist an extremely very old book, once written articulating the genesis of species, titled: “The Book Of Creation”. This book originates in a foreign language and is apparently four thousand years old. Myself I never came into contact with such a wonderful manifestation. .. Yet I was informed it was translated Into Latin from Hebrews and then on into English transcription! At the time I was too busy studying Arabic amongst noble etiquettes and noble epistemology. .. So I did not ever acquire the resources available to me at the time to take full advantage of inquisitorial research! 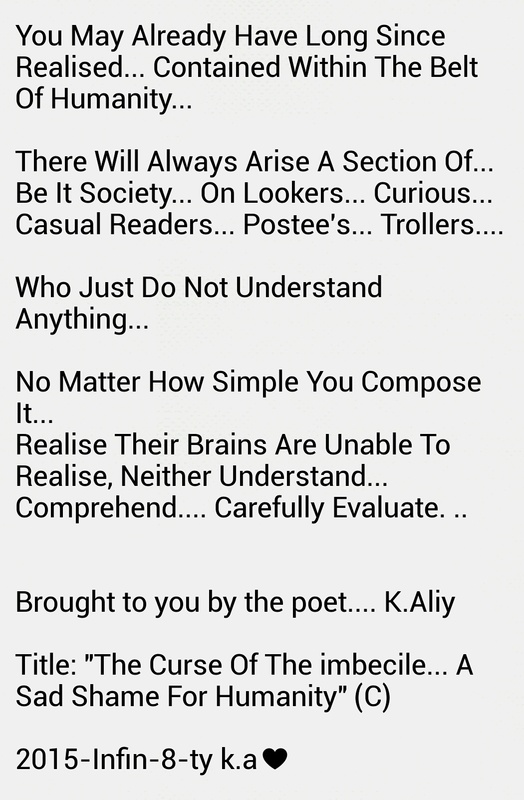 Yet it still remains out there somewhere hidden amongst the vast ocean of deep penetrative literature! As it does in the back of my cognisance! I was awarded the briefest summary of such a manifestation that titillated my cerebrum and synapses while continuing on… ever still upon this momentum. .. of intrigue and fascination! The magnificence of such a manual simply discloses the engineering of each genome and the spirit dimensions! 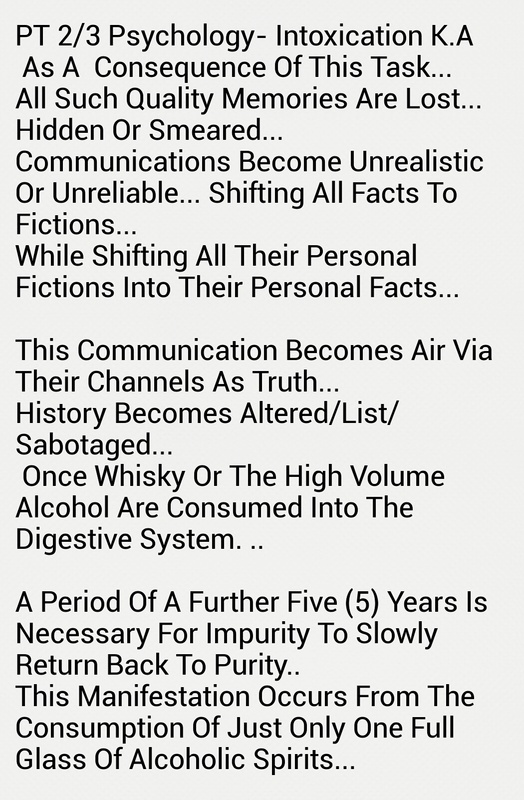 Upon this disclosure I immediately became quite thirsty upon the disclosures at the time… well excited and full of intrigue, I soon locked the disclosures in my memory bank, titled: “To be continued in due course!” I have not made such opportunities ascend, due to the fact of my present programme! Yet something which will unfold in the natural course of events! I was informed by other students who had come across people who knew of the transcription. 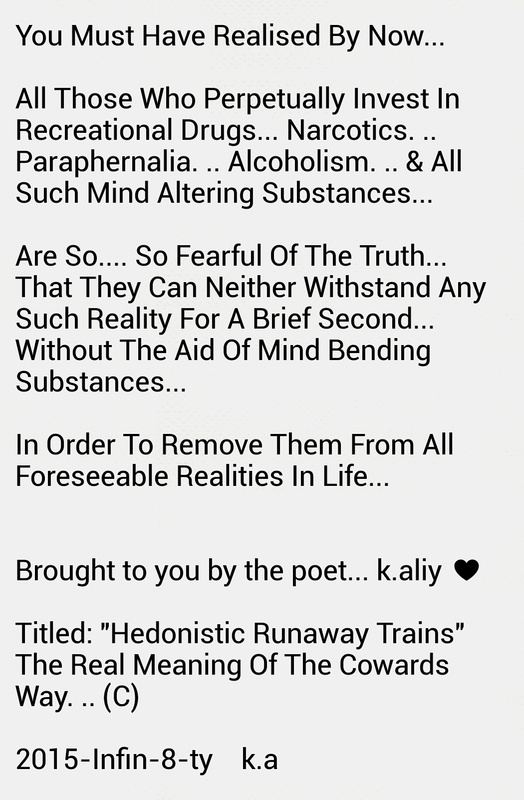 .. Who reiterated a very small verse to me… Which identified several realms of existence above the third dimension (3D) we exist in! Ultimately this book is more than just the engineering of creation! It is the hyperbolic infrastructures of our existence be that turmoil! And in thus adorned the intricacies of such dynamics that no other entity would be pure enough to reach! Thus such dynamics of the greatest organism in existence, are that aligned in atmospheric illumination of the Basal Ganglia… Cerebrum… Cortex… Occipital Lobe… Parietal Lobe… Temporal Lobe… Frontal Lobe… Pituitary Gland… Medula… Hypothalamus… Corpus Collosum… Ventricles… Thalamus… Veins & Nerve System… The dark matter we have come to postulate so well… is none other than that of the bloodline… The Planet and stars are akin to atoms inside an organism! What clues would one leave…? What would aid ones recovery to ascension. ..? How on earth would one ever remember assignments from a previous existence? Hmmmm…. passages. … transcripts. .. what… I ask myself? Tragedies of pain so characteristic of danger and significance. .. would often send shuddering shock waves through the passages of the anatomy! From emotions to the main membranous of the cerebrum would register such triggers, though detail would certainly lay in sombre absence!.. Myself I sense such triggers so I am aware I have left clues for myself to align with… The Cri De Couer senses such as that plus the synchronisations of warnings and messages… These messages and messengers we are not 100% sure who or how they are sent, scriptures inform of angels (guiding light forming atoms) from the creator as blessings! Well received and appreciated in the instance! 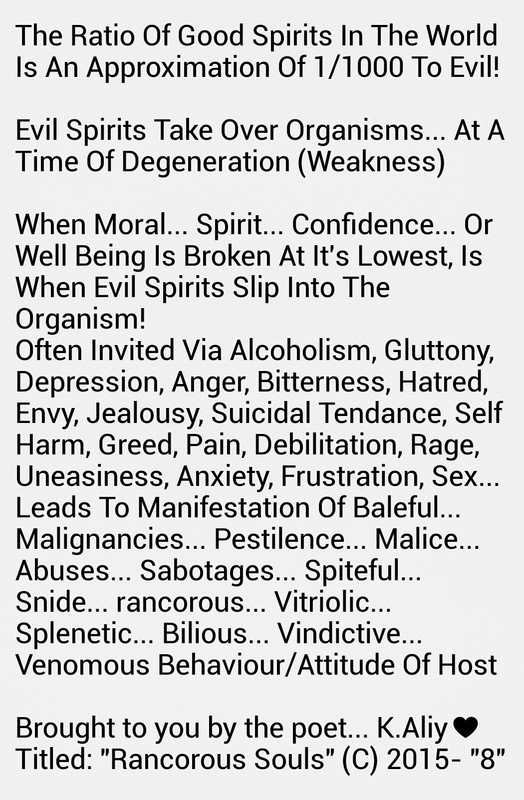 These are certain attributes of the Gin spirit (Jinn) which should not be keenly over looked! I kid you not, this is seriously no such satire moment! By the crack of dawn an approximation of one million (1,000,000) earth bodies would have taken the descend to death via compromised positions! By the moment you have arisen… from your midnight deep slumber, a further one million spirits (give or take a few thousand) will arrive via ascending fetuses to this domain… some illegitimately good… many illegitimately scornful. 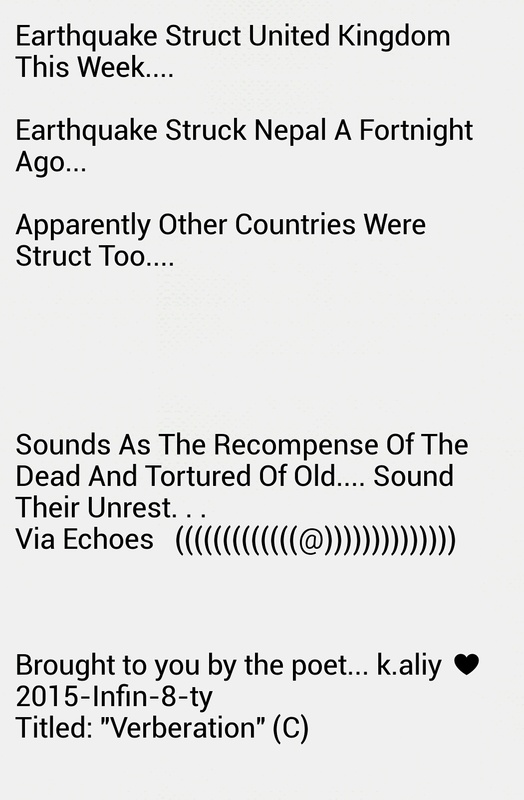 .. only time may allude to which organisms are hosting identified spirits? Leave a reminder for your better self… so when you ascend and descend each in each period you may become familiar with your instructions and path of understanding… towards the goal of higher enlightenment and realm emergence! Posted in Faith. Tagged What Lingers in The Advent Domain? Peter A . Levine (Waking The Tiger, healing trauma). Indeed I will agree in wholesomeness to the above statement by Peter A.Levine. A journey which will cost the traveller, their personal… private and further more future weight in gold! Such an experience is quite often too much load to bare for the traveller alone of such seismic afflictions throughout each life experience! 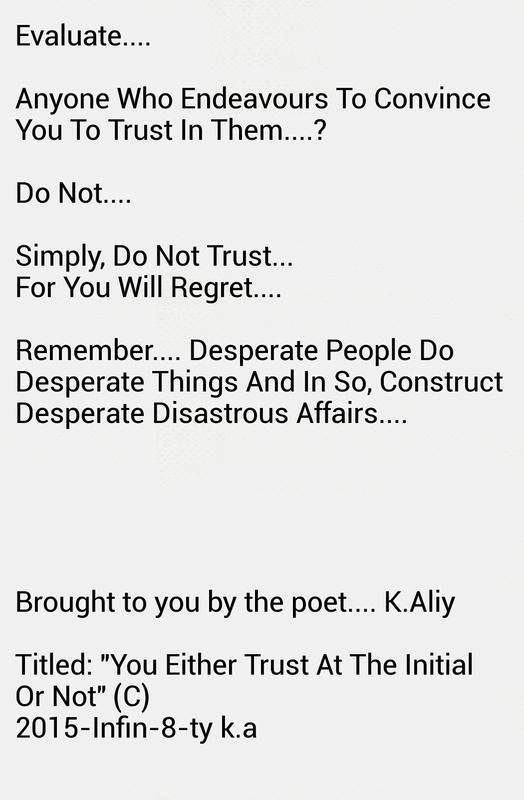 The complete compromise necessary to shift through such difficulties is measured in total by the affliction and debilitating after effects of host… Often bruised… broken and defeated is the affirmations left via the requiem of the dear departure, of those who could not visualise an existence past the present torment! Affirming the word “HERO” is the Greek translation from “He Rose, Rise, Arisen from difficulty… darkness… affliction and tragedy to perseverance over perpetual persecutions! 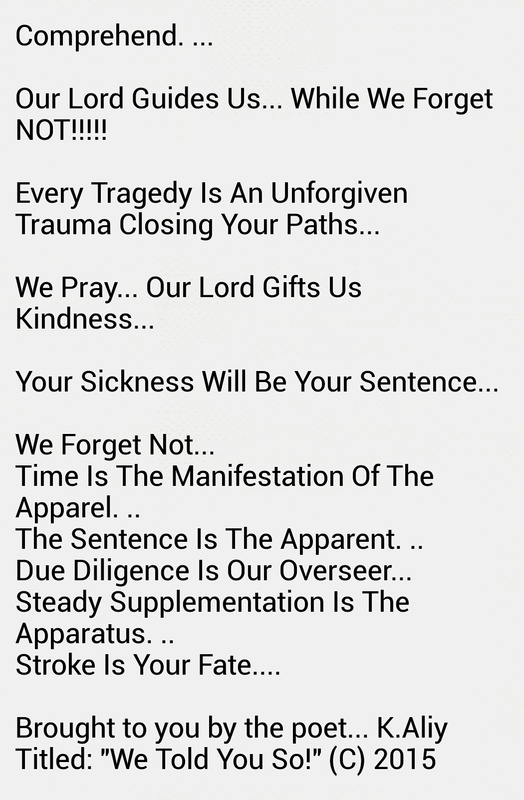 From this above mention one can validate that an afflicted persons journey is non other than a hero’s journey… Indeed insofar as the tragedy beckons the will strives for autonomy outside or out and away past or through the storm of ill affliction! This tussle is non other than that which creates the forces of natures! This affliction is of certain necessity to feel at least a little understanding for the measure of pain afflicted, that would cause any organism be it life, to see no other way through the struggle except instant termination from the present existence! 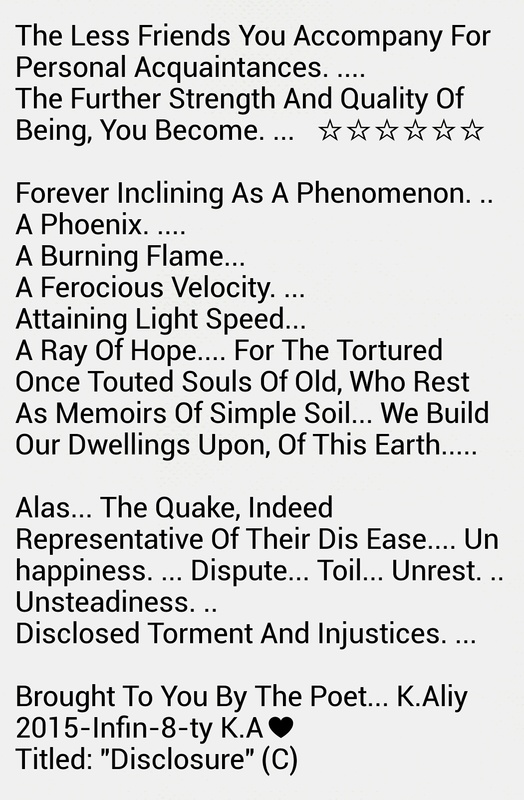 Amongst my self I have come into contact with others who feel/felt the burning affliction, Unfortunately those others, respectively who are no longer here today… journeyed as far as they could through their personal torment until they could not withstand any further! One thing which has aided my journey is the knowledge I have gathered, this has bequeathed me with great understanding of many and much which occurs. From the unseemly to the unspeakable. .. each and all has aided my personal journey, though not easy, yet often quite troubling. 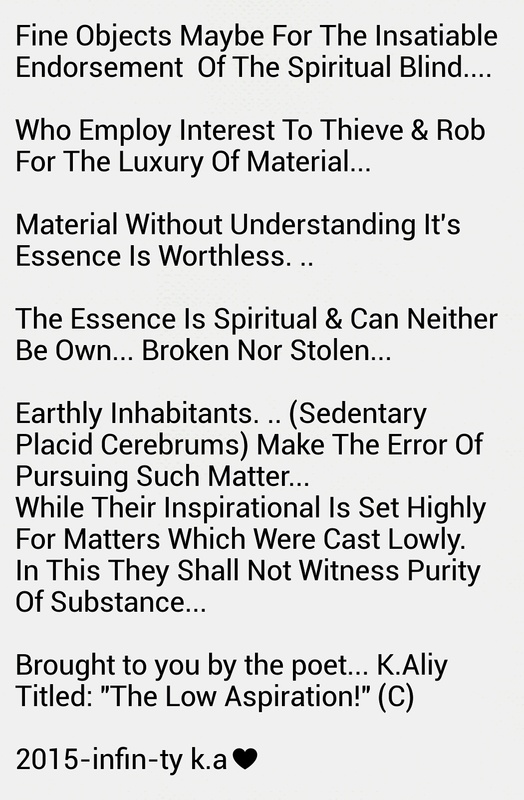 The disturbances has gifted me the valuable and prescribed precious tools neither monetary value… mimic… could ever afford! As we discussed in the previous chapters of evility and the natures of “The Gin”. It is important we carefully continue on with our discussion to disclose that which we can, before either of our times seize in this particular existence! 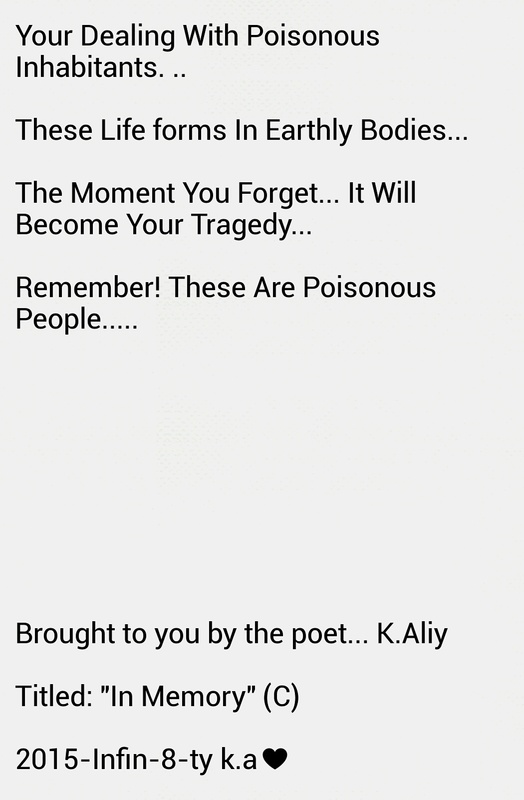 Yet remember! In a galaxy so vast, it may be quite possible they (Albert Einstein, Past Geniuses) have dispersed and reformed in another planet yet to be identified… by the human eye…? A Few Pointers Of Necessary Mention Regarding Realm Dispersion And Transmission! 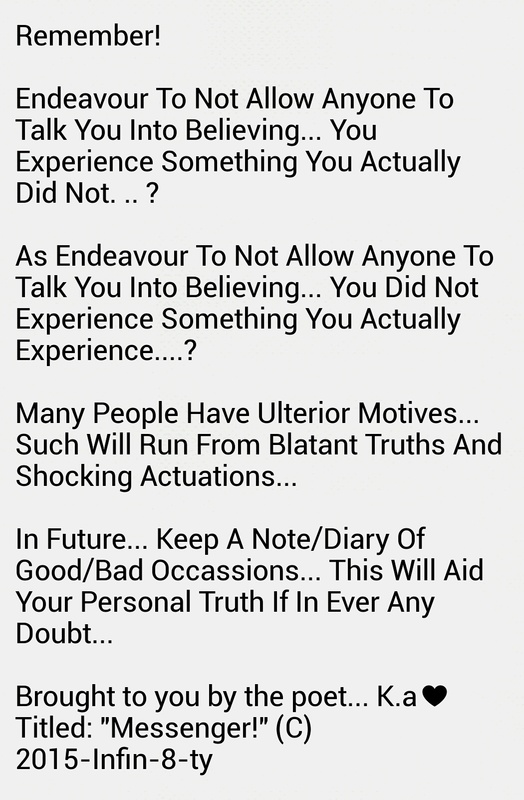 ● Highly Important To Acknowledge, Unfortunately Very Few Things Are As They Appear! Often we may have been allocated to the false believe of appearances. 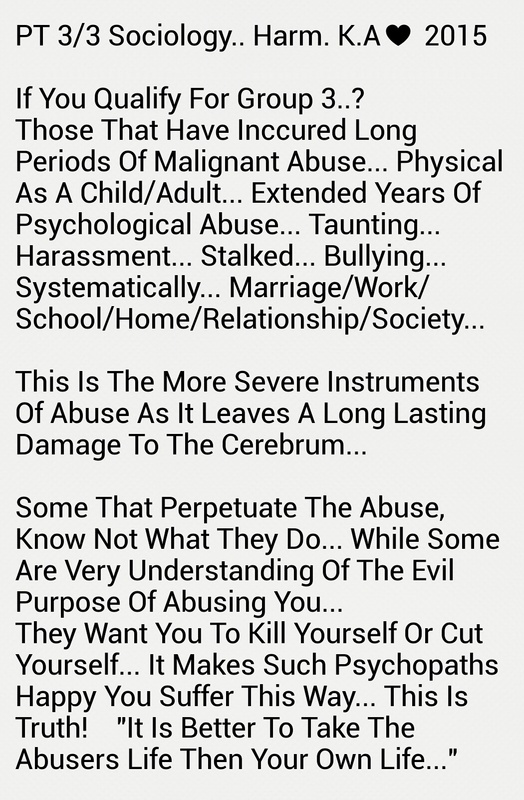 This I have come to notice is a regular hazard among all victims, regardless of affliction, injury, insult or loss! 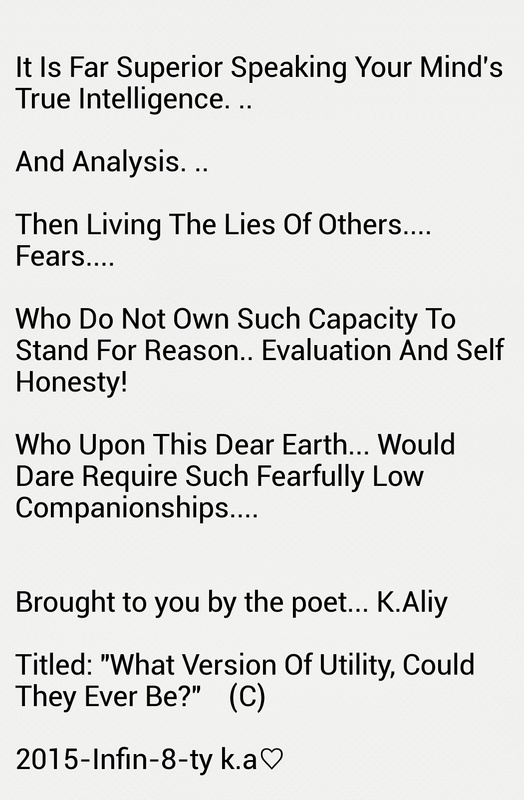 All casualties have one thing in common from deception crimes, that common alliance is the fact such folk place too much importance on the appearance and almost zero academy on the senses that speak to the heart of the body! If one quiets their soul and surroundings regularly, then locates the environment to practice soul ascension and sensing… then the possibilities for spiritual growth is created via the solidarity of personal to metrication! 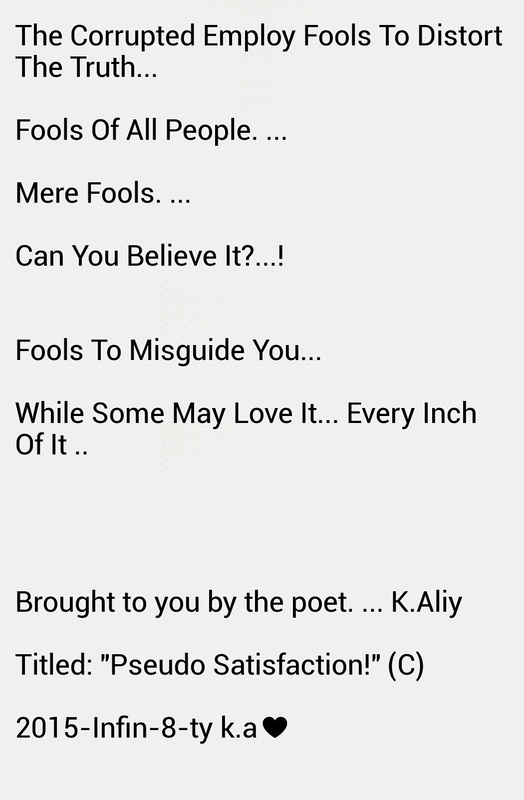 ● Very Few Things Are As They Sound! Often we may want to hear a particular sound or voice, simply because we may have trained our senses to be alerted to that particular vibration! 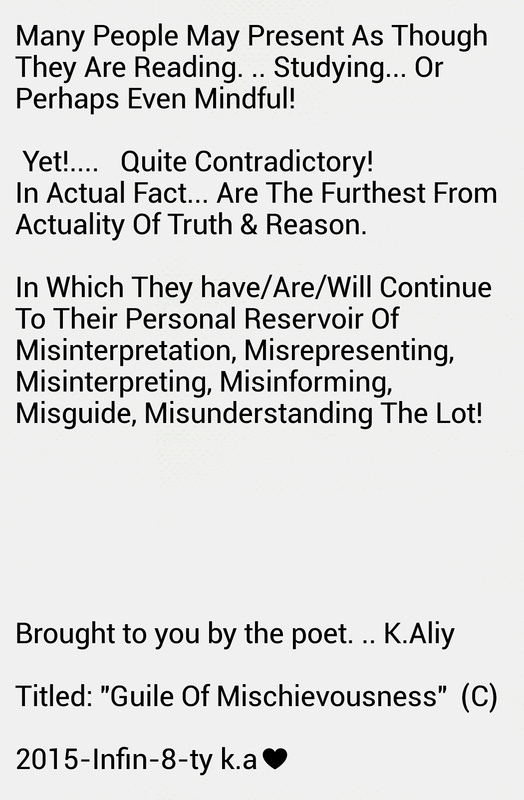 As a consequence such individuals can be mistaken or even tricked by mimic of sound. This will occur when eager longing or interest is drafted for the particular phonology! You may notice the intelligence in animals is usually not so dismantling. .. in which animals have a greater accuracy in the recalling in the terms of phonology (The high fidelity in sound waves and the low drones in frequency of vibrations). Any Renunciation Advocated By The Self, Off And Against The World Of Such… Bilious Forms… Splenetic Hosts… Vitriolic Or Baleful Spirits, Will Indeed Cause A Ramification Of Disturbances In The Life Of That which Is Administrating Renunciation… Spirits and the spirit world cast a dark dormant shadow upon that which “Alights” to pious improvement and stability of self! 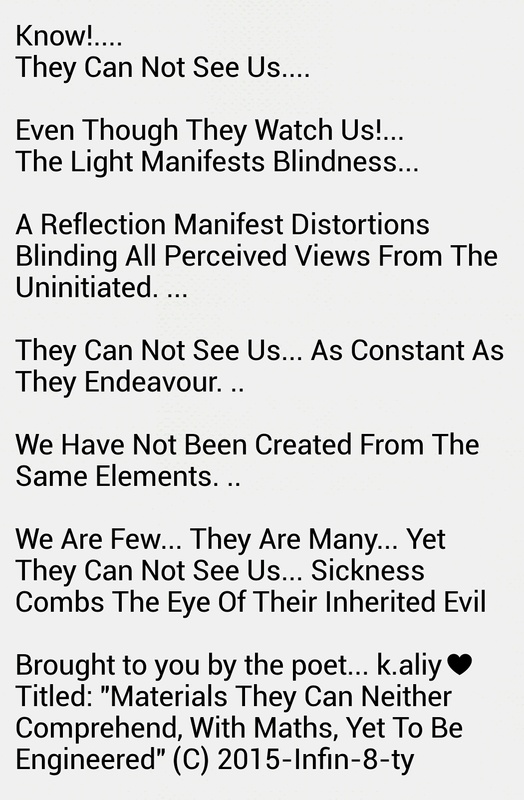 To each individual or companionship, if your are open minded and quite aware, that generations evolve, yet natures remain the same! 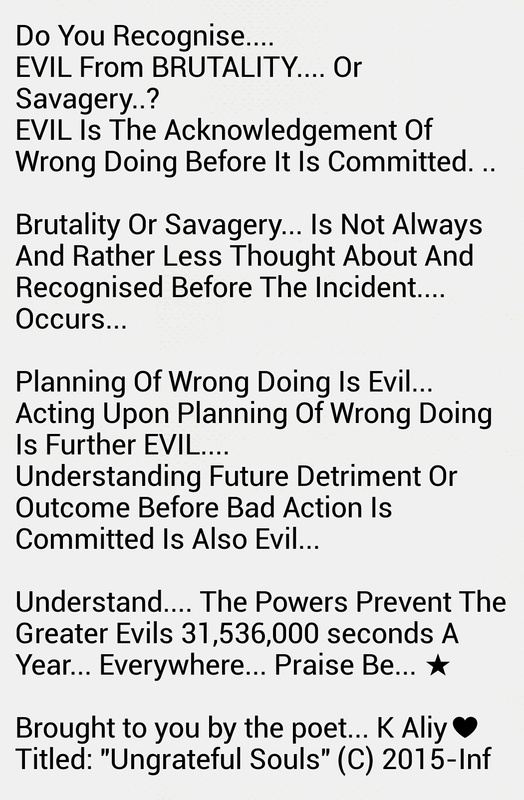 Evil is with in, as it sits without a host or candidate… Evil Never Dies Nor Will Evil Ever Desipate, Simply For The Actuation That It Is Formless, Almost Breathless… As The Rancorous Entity Is That Which It Is!…. The Manifestation of a certain pressure. .. a void… a distortion… the unauthorised penalty… twisted shrapnel… malevolence. 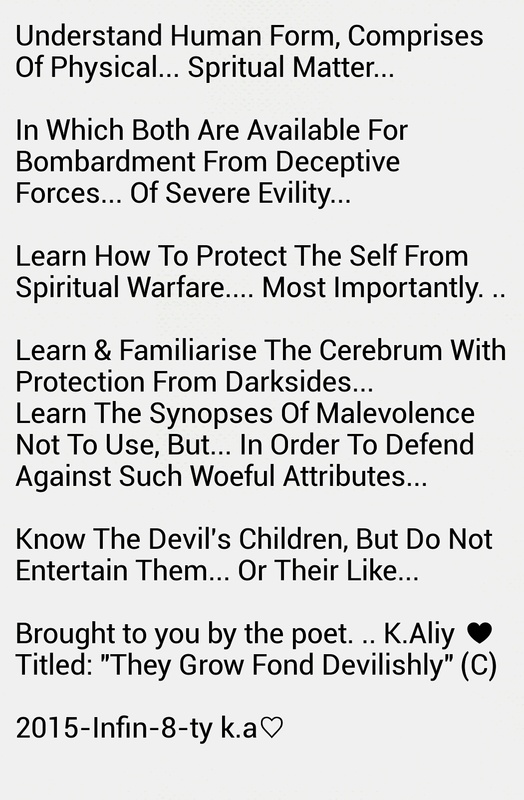 .. All come to the forefront of the pinal gland when evaluating that which “Evil” is…? Strangely enough… both “GOOD & EVIL” have been pitted against one another as they have displayed alternative trajectories of the same coin as one complete force! 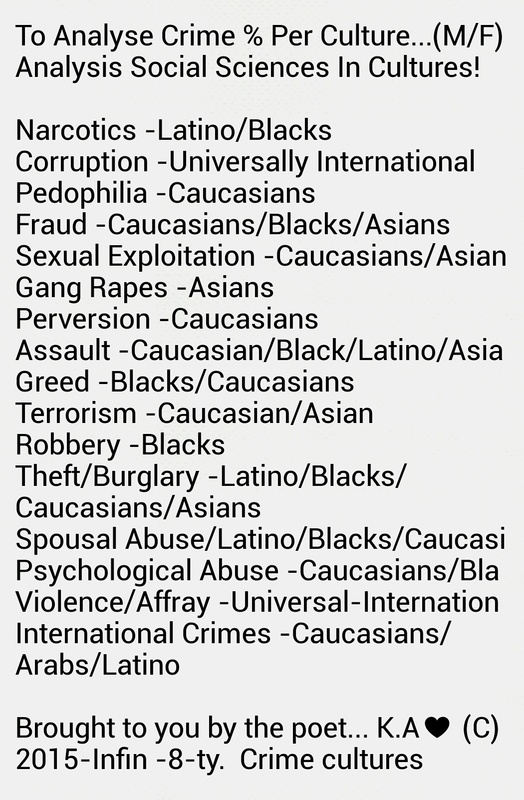 Identifying the true composition of “Evil” as a complete “Entity” is nothing less than difficult! Least of all something which should not be examined by the majority of such minds, which bask in the fountain of sincere “Mediocrity!” For the many who endeavour to sincerely exterminate “Evil” faithfully. 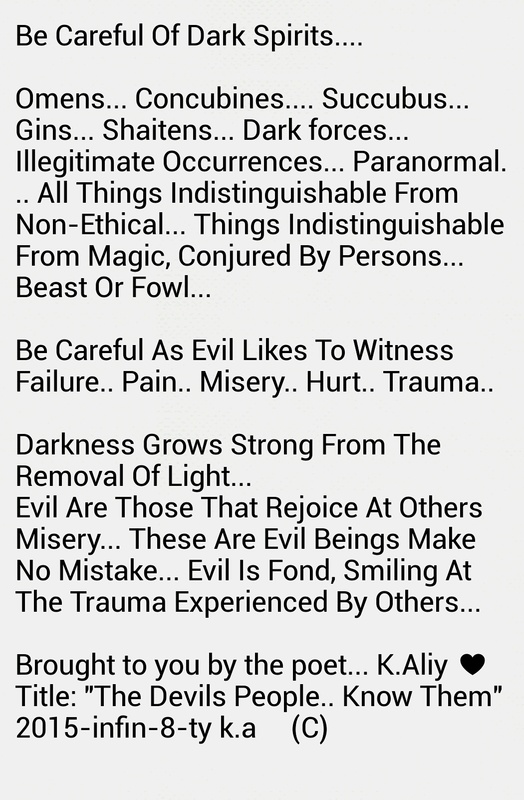 .. Alas such are wildly and hopelessly driven to defeat, consumed by it, lost by it, confused by it, surrendered by it, touched by it, broken by it, torched by it, set alight by it, flamed by it, eaten by it, devoured by it and buried by its force of nature, be it “Evil’s Twin” companion “Fate! Spirits live with in each host or organism… the life force to each mechanism. .. Some spirits as we have already discussed have been long since created from nitrogen and oxygen combined! Such spirits are of a very increasingly volatile nature, and can explode akin to a lighted canister at the most rarest of moments! As we discussed in our previous chapters here in this volume edition! Also, please remember we stated, some spirits alter their idiosyncrasies over time… A spirit with a volatile nature which has existed for millennia, would have had the opportunity at some stage, in it’s history to evaluate and contemplate it’s very nature. Every intelligent life force contemplates existence. Contrary to that which you may have assumed, “Cats” contemplate, aswell as “Dogs” and all ungulates and species of this dominion.! “Hanging. … Swaying… Pulsing… The most vulnerable and insubstantial creature… Has for it’s defense the violence and power of the whole ocean…. To which it has entrusted it’s going and it’s [whole] will [power]. -The Jellyfish- By Ursula Le Guin (From Lathe Of Heaven). As we discussed again, in the previous chapter, the natures of things and their various substances endorsed by unique environmental pressures, constructs, destructs, the dynamics and contours of the elements soul [Force]. 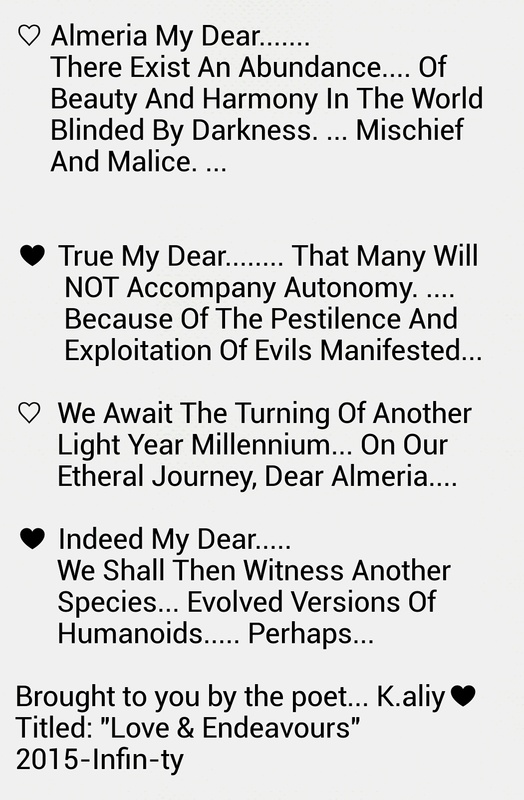 In this chapter I would like to enable the user here of this manual, to pay attention to idiosyncrasies of malevolent behaviours instrumental by the characteristics or alighting of agent, be it spirit [Dark & Evil Natures] Invested in organisms! 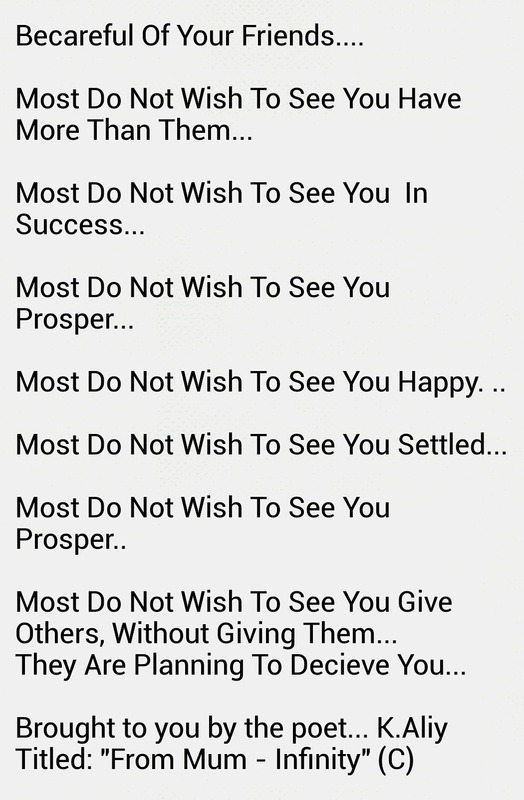 No.1 Characteristics of bilious spirits alighted in the following list. 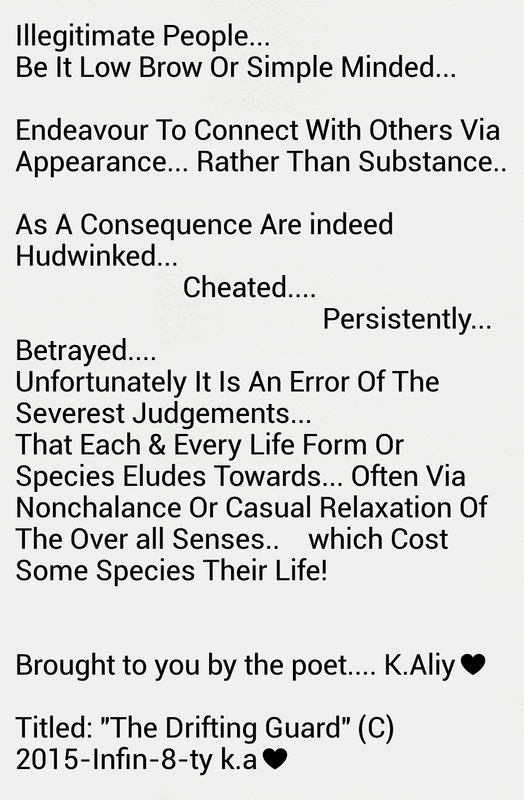 ● [Seven deadly sins] Envy… Jealousy… Glutton… Greed… Vanity… Revenge… & Sloth! The natures of bad spirits are often capricious and mercurial. .. One that often can not be trusted. A red envious eye that is never satisfied, will often find hostilities in the most kind established folk. Such spirits will demand the properties of others be beneficial to them as property without the legal routined examined! Often vindictive and immature. Sloth like and addictive without genuine illness inhibiting organism! 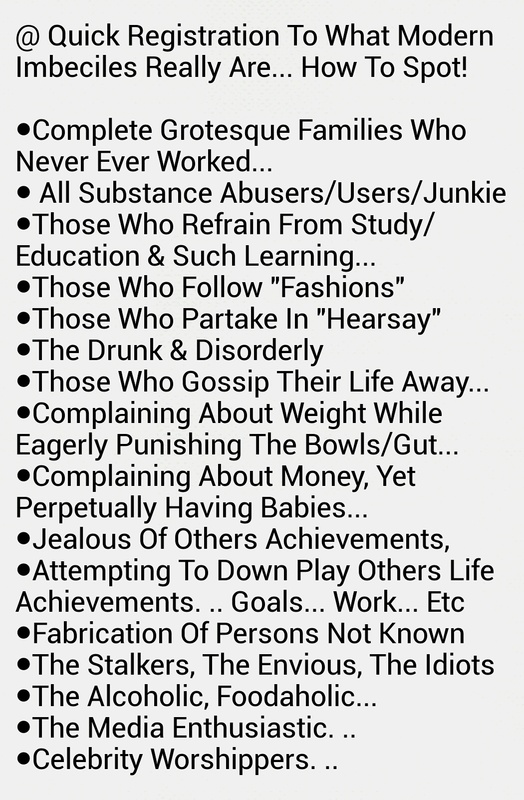 ● Back stabbing, Slanderous, Propagandist, Defamatory, Argumentative and highly equivocal without real or authentic substance or education [Argue for the sake or out of hate/envy/jeolousy] Inappropriateness! The fire-soul spirit, is one which is totally at a non restorative phase in it’s existence. 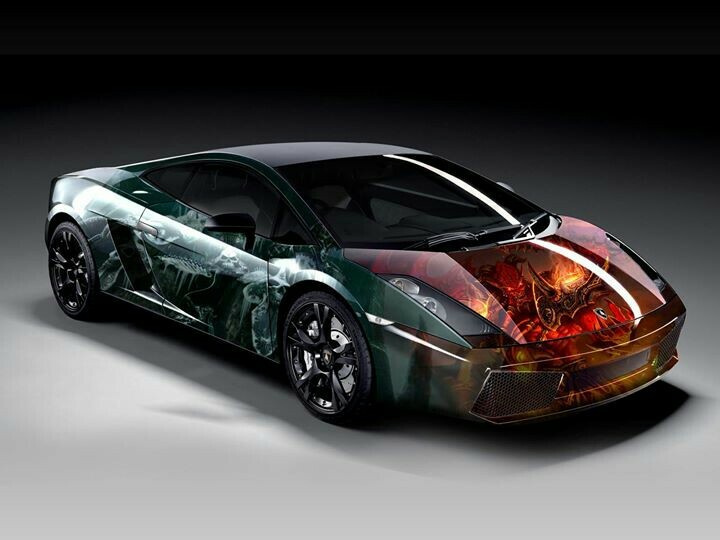 Possibly as it matures, the flame may burn slower, exchanging its characteristics for a more mature autonomous benign! Akin to an infant, unsteady, restless, hurried, fumed, unprecedented, unschooled, unsophisticated, spoilt! ● Judgemental, forceful, unrepentant, nonchalant, disturbing, hot, fearful, provoking, destructive, powerful, insecure, fearsome, governing, intimidating, persistent, burning! 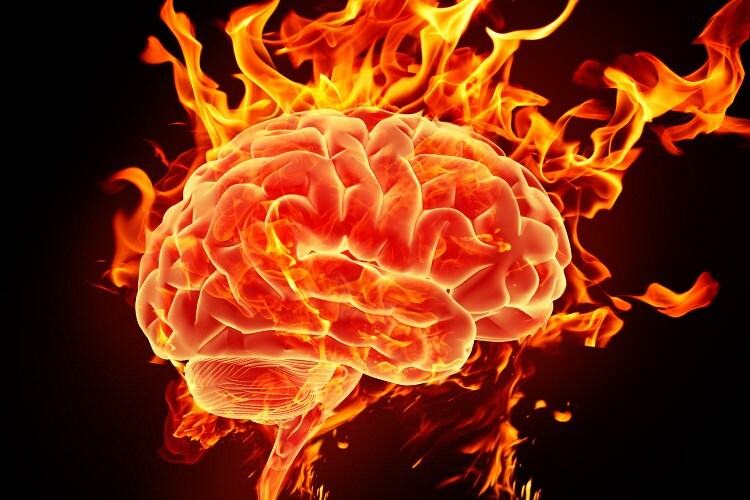 Such of the comprisement in forces of natures, as we discuss here the element of fire [One Fifth (1/5) of the elements of existence] without its connected aligners in water, earth (compressed matter), wind and the elusive substance of spirit, confides to build life in action! 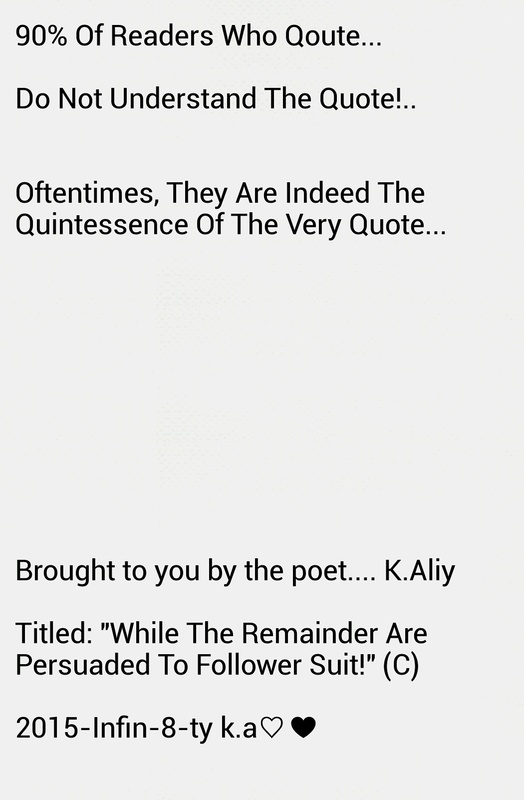 Oftentimes, it amazes me… because I now understand we live (exist) with nothing but fools, it is a quiet shame to wholeheartedly realise the very thing that Jesus ““Isa Al-layhe Salaam”” (Jesus Christ peace be upon him in the magnitude of the supremes blessing) had to endure two millennia in antiquity! When I first commenced my journey many years ago, I initially envisioned a wide landscape of many genuine enthusiastic souls awakening and entrusting. . 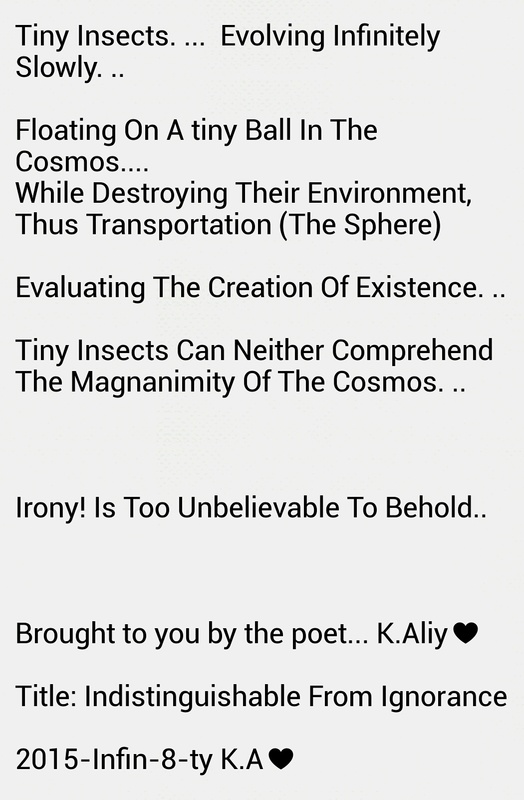 Yet that which I discovered was quite contrary to my own tiny imagination in the synopses of the cosmic awareness. . 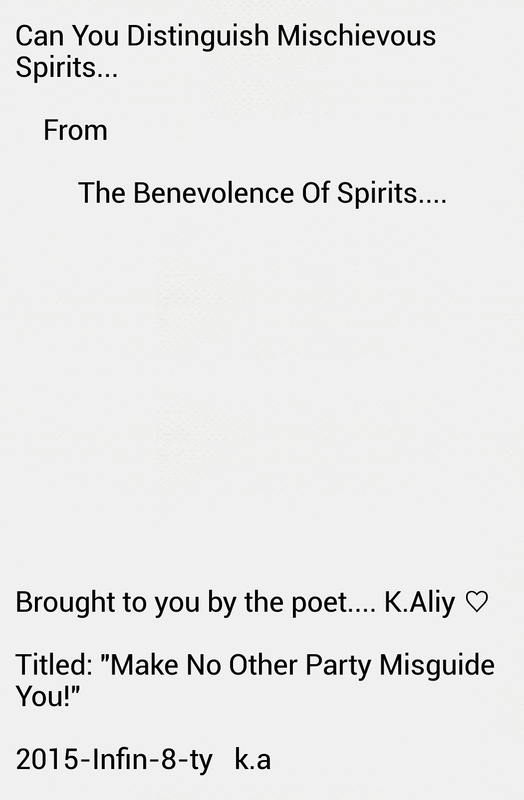 Upon this intriguing chapter of the malevolence of fire spirits. . Be it intentional or nonchalance. 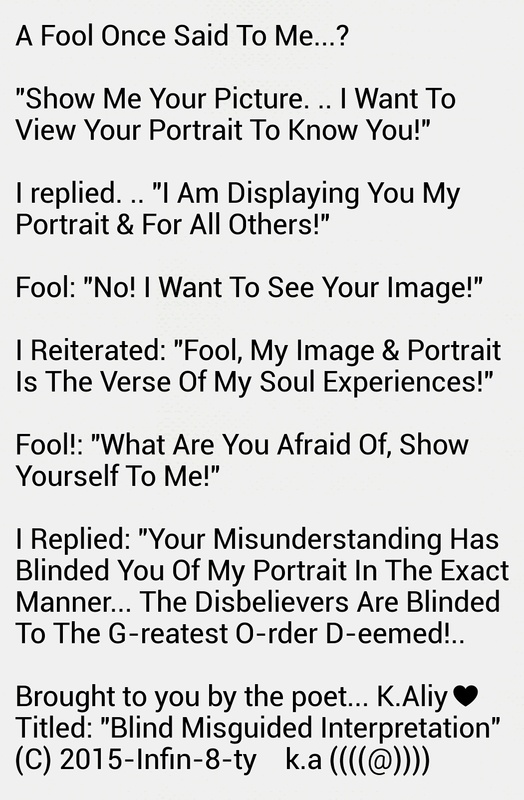 ..
A TALE WAS REITERATED IN AN ARABIC CLASS MANY YEARS AGO.. TO US… THE STUDENTS BY THE IMAM! Ibliss, dons his majestic gown upon a wide golden throne that rests on the unachievable surf of the ferocious waves..
Satan controls the temprement of the hour while he awaits his 3 most trusted advisers. After decades a gin approaches satan as satan patiently awaits heresay! And banishes the gin to disintegration with a waver if his hand in a sweeping motion! The murmuring gin.. exclaims. ..
AFTER Many decades past. ..
“My lord my master… I thank you for the opportunity… Your subservient worship here. .. In the ultimate device against well being is the instrument to destroy a string union… (Weak union). For the supreme powers give one to each other in union against hard times… They who can withstand all temptation are truly victorious and saved… (Strong Union). As Ibliss is aware Of this structure… Ibliss employs the evil vices to disturb companionship… For element is easy to control without security… be it faith… union.. or discipline. .. In this important chapter, here by, it is important we deal with severe matters at hand, by the underlying utterances of thus issues, not fully Pre-aligning… Pre-liaising… Pre-realising… Pre-analysis… pre-recognising such realisations of problematic Re- accuracy… the denial of such actuations… and the future torment of avoiding these affirmations. .. and occupiers. 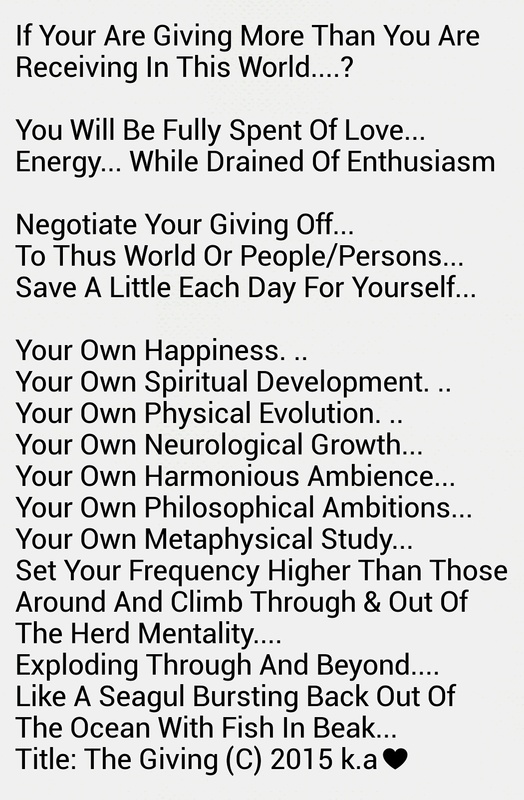 .. which you hold the keys to dismantle… virtually! It is imperative to understand the level of mutualism. 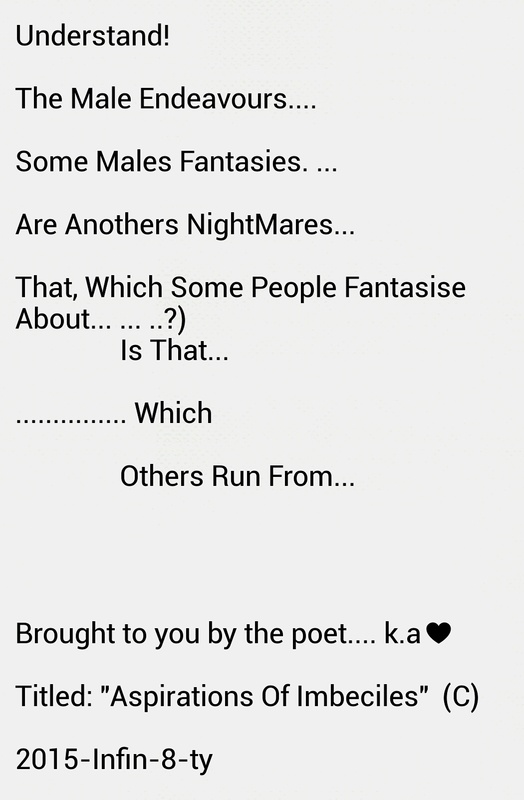 .. be it mutations that exist inside this domain. .. 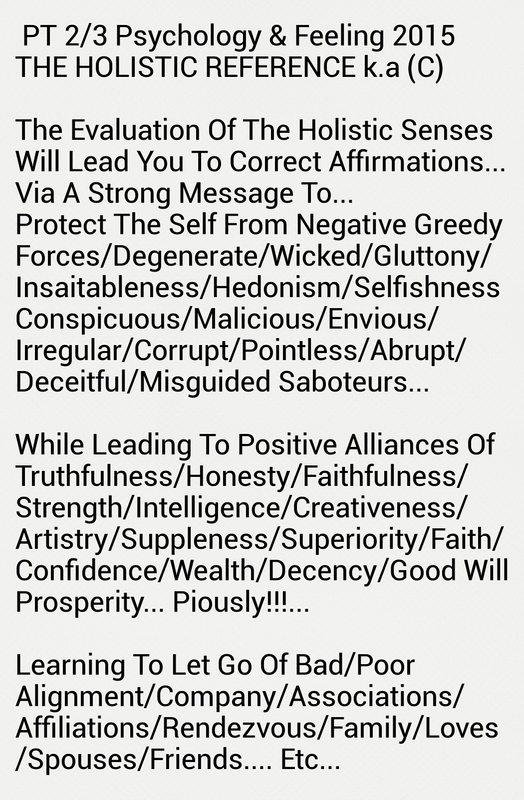 The catastrophes and inhibitors of our ascending are known as “Evil Spirits” in the English Language! Procrastinating on such seismicity in the bowls of detriment, is truly a predictable affliction in the unravelling of one’s own demise! The ascending is totally necessary to exit this realm and incline to the next chapter of our photosynthesis or organic symbolism… For some who are better prepared it will be an amiable transcendental affair to the superheterodyne frequency and through the atomic structure of what is stated in the English Language as “Quantum Mechanics”. Ultimately this is the basis.. the levelling of all matter… the phonology…. polychromatography. .. the high fidelity of existence it’s very self… the sophisticated emblem of existences. .. The acknowledgement of the creator in its natural state…. 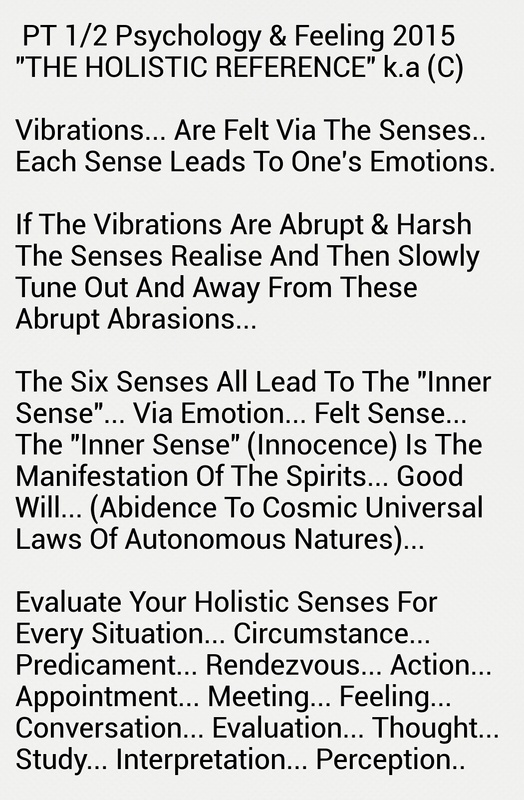 VIBRATIONS… In the English language stated as the “KUONS” and all particles smaller not yet recognised! It is a blessing to be with the one!… That one is non other than the cosmic actuations of the supreme force, which is highly evolved and the first entity which ever experienced existence in the most natural form possible.. This force has been given many names by many evolved and spiritual persons in multiple languages. 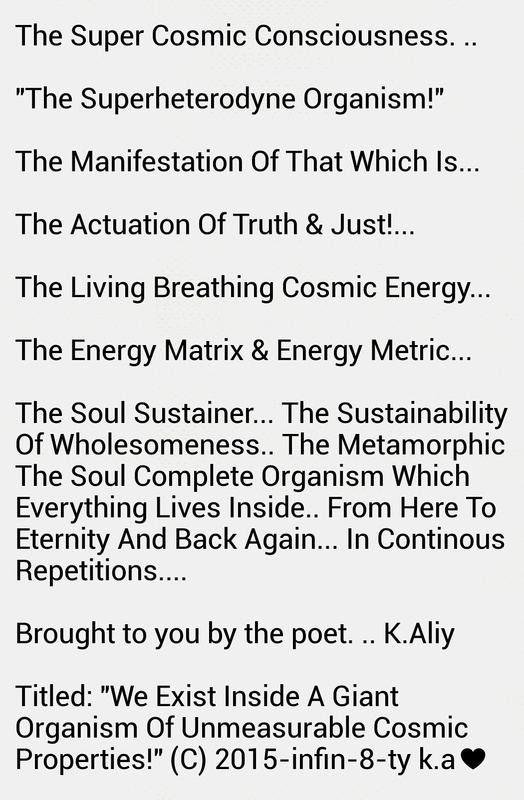 ..
To The Unintuitive… The Name Is God… He who Grants Dominion Over Everything Everywhere… To The Scientist The Name Is Space “The COSMOS”… To the Spiritualist The Name Is Energy… Electricity!!! To The Highly Aware The Name Is Not Important… What Is Important is The Relationship… Thus Understanding. .. Of such a magnificent being…. Thus, encompassing each, all, everything, everywhere! Thus it is imperative you allow your own heart to continue directing you throughout your life… Via this frequency channel omitting from the super consciousness. .. if you are still… motionless but steady breathing and silent long enough like a good child. .. a prospective deer… a dear bee collecting nectar… you will sense and comprehend the etiquette signals of such a high fidelity omitting from such a vast quadrant! Understand the powers that be, are so vast to speak in its natural tone… (Although the super vast power amplifies much in the way of super novaes… clusters… galactic arrays… and seismic phonology) our hearing is too delicately unevolved to read these waves naturally… Mammalian quite contrary to that which you may believe… are more evolved then the homogenous applications of sound via mouth/vocal cord… Animals can detect momentum from miles away by sound waves… and can communicate at long range with the densities of low frequency vibrations. This feat of communication, not one evolved human embryo can compete with untill final breath has reached the body, while the lungs lay motionless. 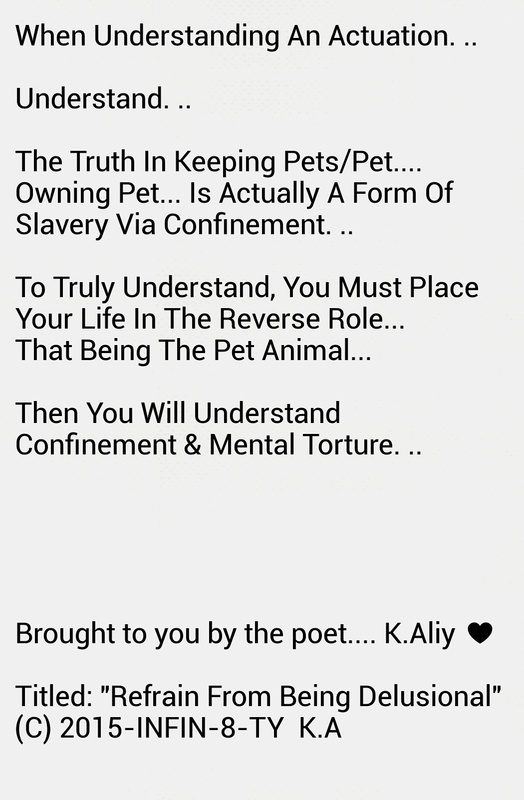 Firstly with complete due understanding, it is important to acknowledge we are initially spirits.. effervescent phonological entities diminished in statue to comprise these earthly cages we have been conduced to inhabit by compression. .. When we expand. .. or grow we incline away from this sedentary position of this temporary spatiotemporal cloud. We manifest outwardly and spread our symbolic wings (Energy clouds) which aid our journeys… swimming through the telescopic electricity of dark matter! We become like angels, but not in appearance. No! More like in capability and energy flow through things and around, holding no boundaries to time and space. We mimic electricity itself in such a state of inclination! Our seer, has taught us many things about our history, the journey, power, abilities, fears, evil spirits, darkness, the super consciousness, malignancies, nature, protection, autonomy, company and just! 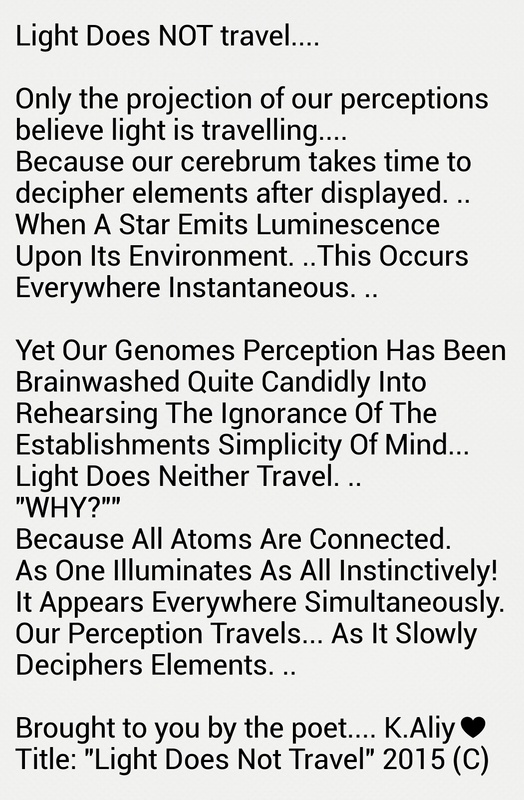 If you have kept a close eye on this blog address https://khalilaliytheenlightenmentbomb.wordpress.com in the last few years… ? It has not been in vain, though I can honestly disclose to you, fortunately unfortunately, I have only disclose to you A Mere 100th Of 1% in Knowledge so far! 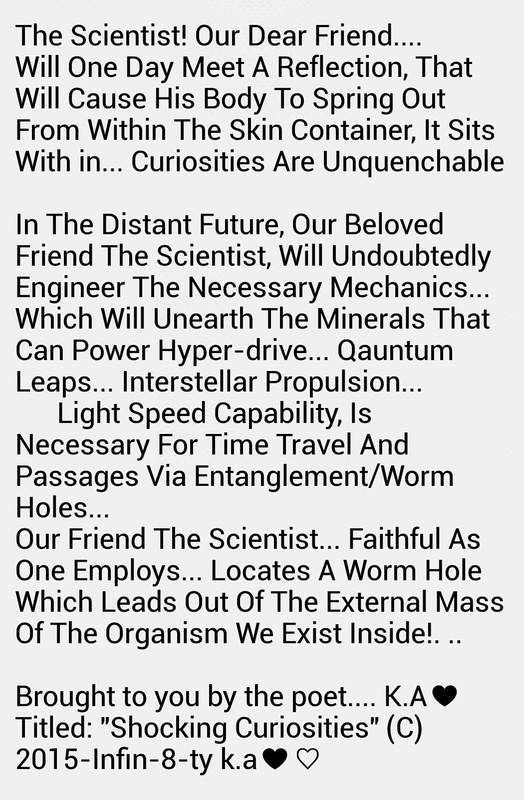 That is 0.01 of the intended 100% information I have disclosed to you so far, regarding our journey in this sphere! Some of you… or be it most of you, will not live long enough to receive the complete information from my memory data banks… While the remaining lot… I will not live long enough to complete my studies to invest upon you! Though when I am dead, others will pick it up, who have been carefully and precisely channelled to receive and decipher spiritually intrinsic matter.. 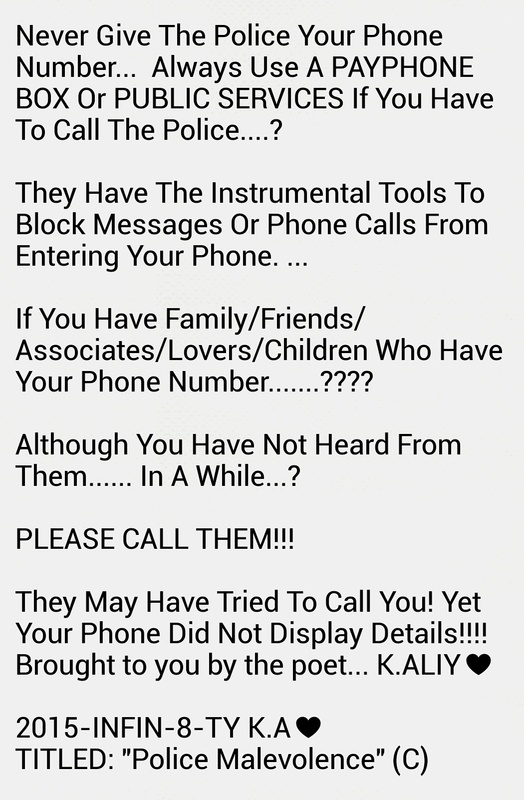 Thus information! As we await new information… the passing of that which we class as time, will see bodies rot… as many are no longer with us… who were here in strength yesterday… Tomorrow shall neither challenge this rule of actuations! As many will rot, as many will be misguided again.. along thus lonesome road! 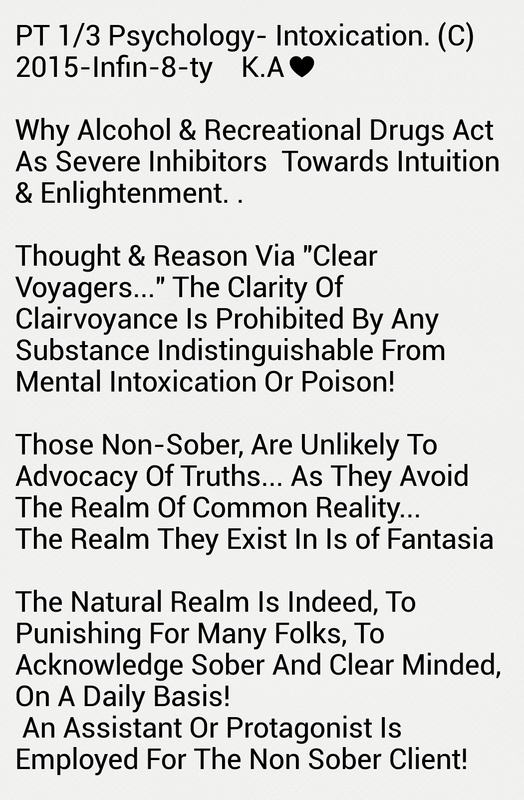 It is very important that I disclose to those of you who do not understand the everyday affirmations of thus spiritual warfare being waged upon this domain (plane/universe). 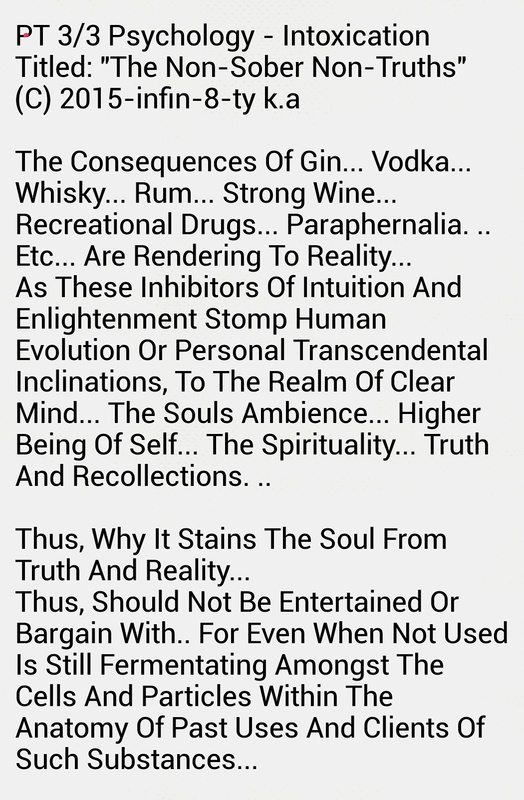 There are in spirits which for one reason or another did not prospectively transcend to the next realm of state ((((((Being)))))). Also as a hazzardous consequence could not or would not re-enter a earthly host… Possibly they (Diseased party exchanging dwellings) did not like the alterations. .. alternatives… new dwellings of host or appearance. .. It has been mentioned that an entity can reform back into a worse or lower inhabitant than the one he left on death or exchange (Parting of the body by spirit host to new body plane). There are a number of reasons why an entity can reunite with matters in this plane! Examples range from unfinished duty to Personal Cri De Couers! Who knows of the actual reason but the host it’s very self! Some lost spirits are known in the English language of parapsychology as the German named “Poltergeist” >> Which translates in the English language to a very noisy ghost! Poltergeist have been known to exhibit traits of malignancies and bitterness… trashing previous dwellings and instrumenting nihilistic nuances on present tenants of dwellings! It is stated that a unnatural sudden or tragic ending to life, can often and will omit the devastating manifestation to the life of a new dweller who happens to come across the life of a poltergeist, that should have left its position! It is also stated that gins… which is the Arabic term for evil spirits can be just as vindictive! It has been stated that the first gin ever created was known or named as Iblis [ Ib – Lis ] Which has been stated to translate to the first! Such a life form we have been educated, was created out of nitro oxygen and carbon… This is a heat substance and has a fiery attitude and temperament! Yet When Gin (Iblis) was created, it’s instructions was to live amongst the older inhabitants upon a world not named! So the gin (Iblis) lived upon thus a world full of fiery like substances in nature and appearance… Thus the Gin (Iblis) first and only one of it’s kind was the new inhabitant upon a vast world of magnanimous size! 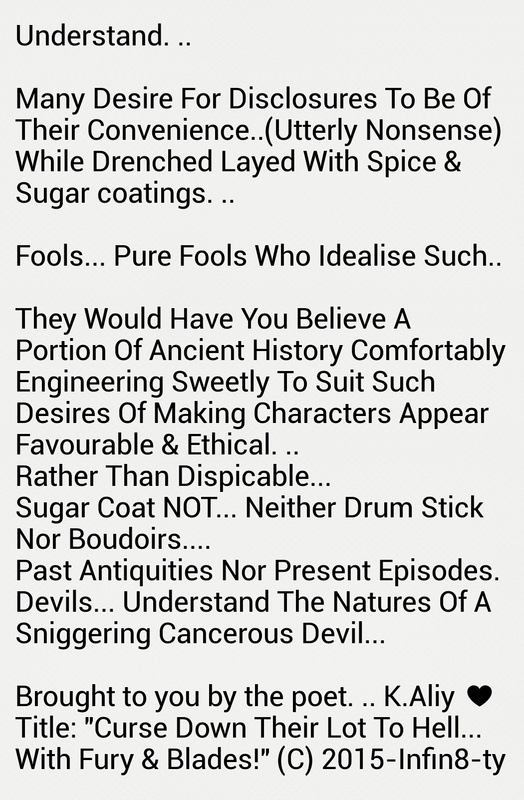 The Gin (Iblis) was demeanour in statue in comparison to the giant shaped inhabitants of the world! To approximate the size of the Gin (Iblis) for understanding scriptural affirmations, it has been learnt that the gin (Iblis) was the size of planet earth, and the gin (Iblis) upon the world it inhabited, in ratio to the planet it inhabited, was ant size structure to the planet itself! While the other life forms where 100 (×) times the magnitude and volume of the gin (Iblis). Through this we can picture the vastness of the metrication of both worlds and species! Understanding such a fiery temperature exists inside such volumes excludes anything we come into contact in our life here on earth! It was stated that the fiery inhabitants of the planet existed for millions of millions of years… in complete anarchy… while the created had witness there destruction! 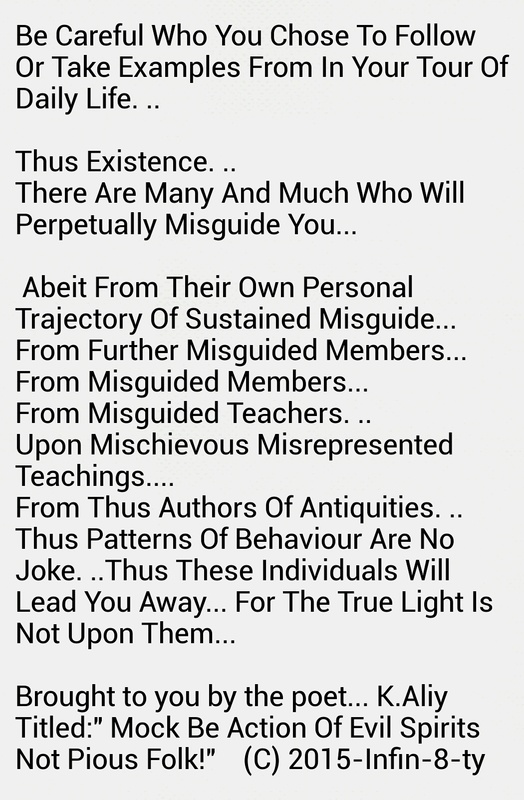 (I imagine here, that knowledge was demonstrated to these fiery inhabitants of the best way to conduct life upon their dwelling, yet I am of the opinion that the wisdom must have been lost or misguided in time!) So the continuation of chaos and destruction continued long after Iblis had existed for millions of years upon the planet of fiery inhabitants! Eventually it came to pass, that the inhabitants were so chaotic, they would destroy the planet and everything in it via their own conduct… The gin (Ibliss) was removed and placed with non-choice making inhabitants in a cluster which dwarfed its previous home by ratio of atom size to universe scale! The revelations stated through the inhabitants free will in decision making, autonomy was never ever a choice impacted upon or favoured! 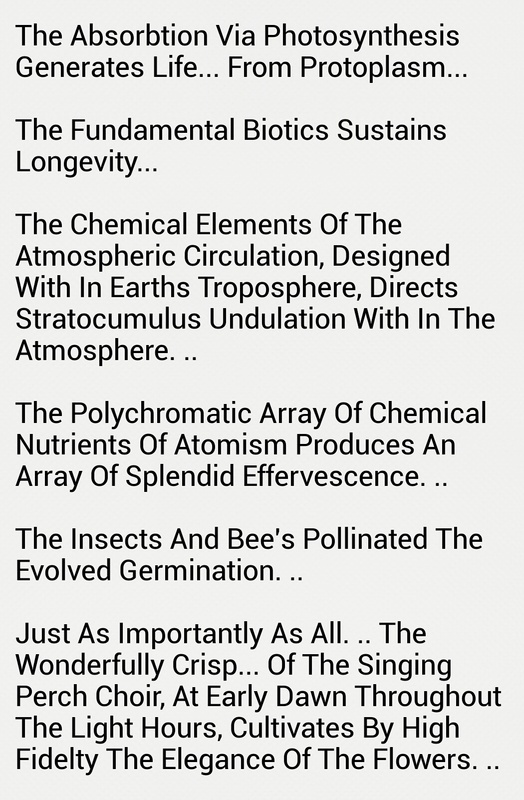 I can understand this via attitude and environmental structure and nature… As it affirms their nature and essential essences, idiosyncrasies in the structural creation of the species and such an environment of chaotic disorder and existence! SO AS IT HAPPENED, THE PLANET INDEED EXPLODED INTO FRAGMENTATION. 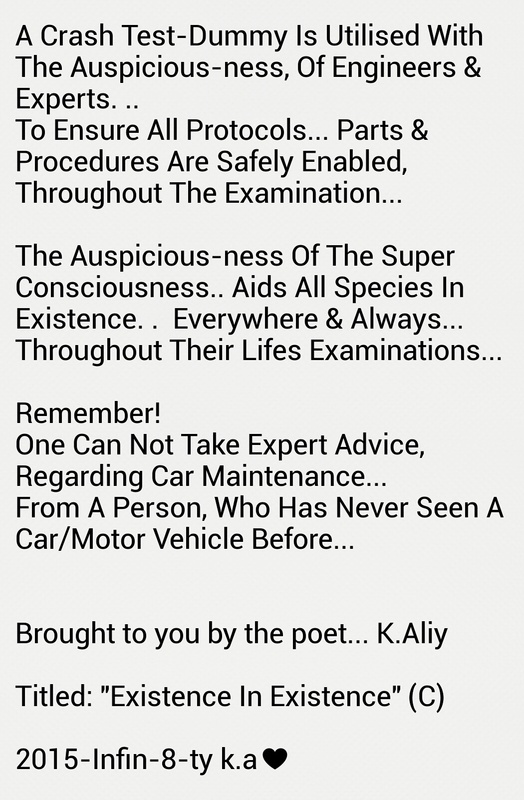 Either by the ominous of the super consciousness or the exploits of the nihilistic inhabitants….? It has been mentioned that though this explosion occurred billions of light years in the past… fragments of luminaries still light up the zones which these species existed.. It was also versed that not all of these colossal size species was destroyed… these giant wave particles we see via super powerful radars are the alignment of such species roaming lost in darkness! The frequency of such colossal size entities roam for billions of light years.. these clusters are their dwellings! Fragmented or born small or condensed into earthly sized inhabitants. 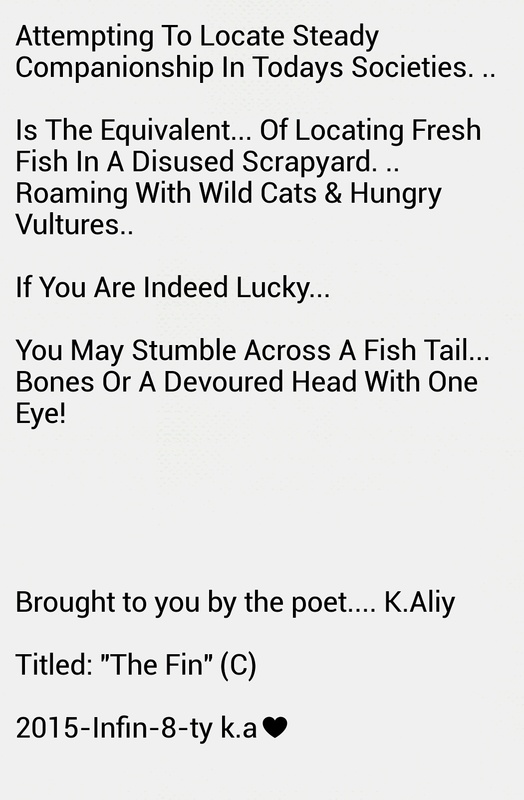 .. many roam amongst us in search of their familiarity and chaos! 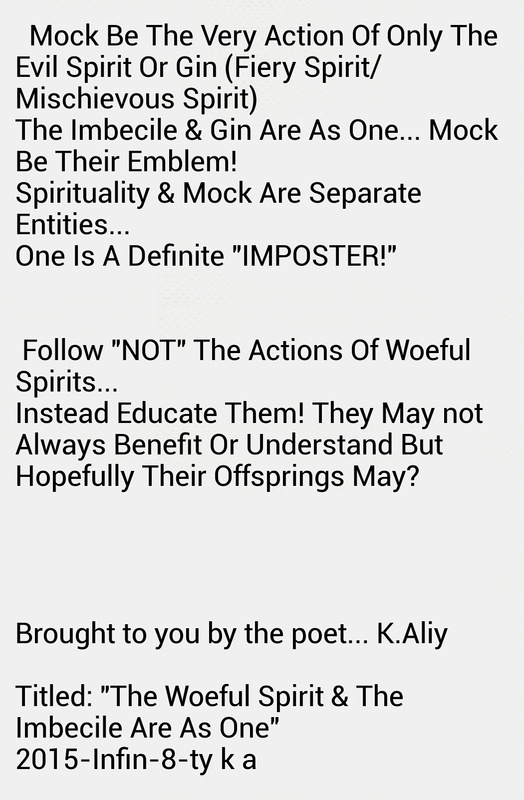 Some pointers to recognise here on earth, regarding the recognition of spirit idiosyncrasies. .. Understand that some spirits are good and have travelled long and hard to find a body of condensed matter to comprise into… Some spirits do not even know they are a fiery spirit… While some fiery spirits do not know they have a wicked nature… Whereas some fiery spirits are subliminally pious… in which they will never harm another living creature until they are harmed! 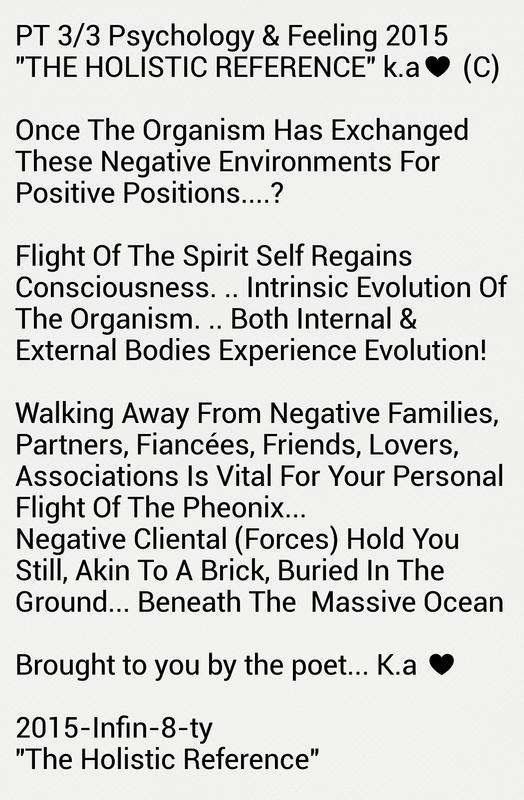 Some spirits as they evolve… somewhat devolve back to primitive protoplasmatic cellular organism… Thus.. This non negotiations of spatial temporality alignment, strikes a ripple of chaos out of subliminal alignment with intrinsic patterns of autonomous sync… then juxtaposes a rudimentary insubordination towards anarchy or be it superheterodyne miscarriage in signalling mischief of atomic waves..
A ATLAS, the code of order is out of sync and the species or host has lost its way. Thus not in nimble form, top shape or excellence! The strobe… the universal consciousness attracts genuineness. .. it is the headlights on the universal plane of the cosmos! 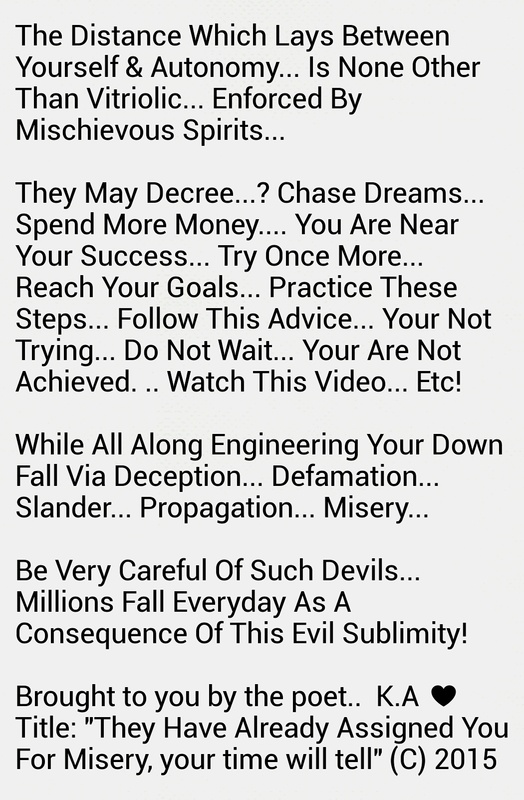 ONE CAN NEVER STOP A EVIL SPIRIT, BY ATTACKING THE HOST OF THE SPIRIT! 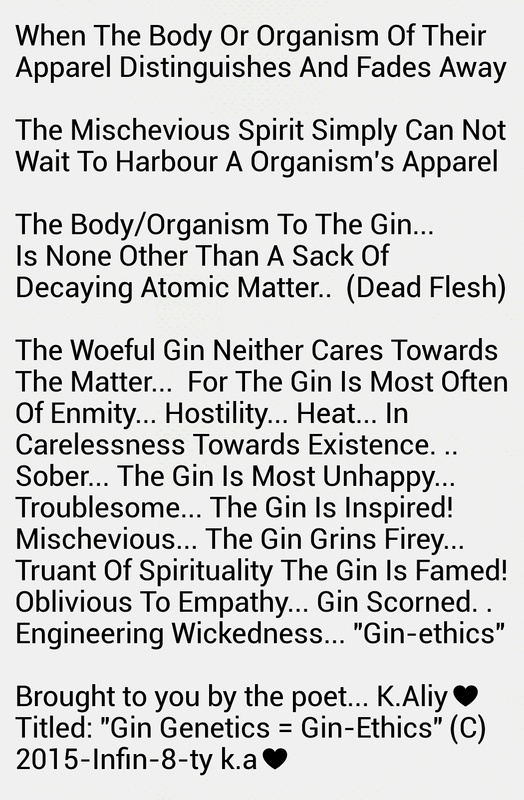 A gin will leave any decaying body and explore another host..
To rid a gin, it must be destroyed with that which it is made from!!!!!!!! Gins evacuate a host body when it is in decay. Gins are well aware of the smell of death from afar… You may have witnessed people who was rushed to hospital with severe and detrimental illness, often life threatening and on the vanguard of death…? This is the moment the gin will leave the body… The temperature rises as the gin knows it is time to find a new home or host! Sometimes the gin is careless, over stays the episode and feverishly hunts a new host. Often if the host recovers and the gin has left. On return to normal life, you will notice a improved personality. This is akin to the individual starting life over again or given a second chance. The reason for this is the soul had been poisoned all along with a devilish spirit eating away at its core.. This is often the reason people return out of a coma or along hospital stay after life risking illness, in a really positive and inspiring sense of well being.. Not only is the illness vanished but the main agent which was breeding the illness vanished with it!! If you happen to drift a shore on to such lands, be careful where you may end…? ln a village long ago… in a quite town somewhere in the land off The Eastern Hemispheres. .. on the Island sat a peninsula across the ocean….. Elephants roamed the island, shared with other mamals and smaller ungulates which dined upon rats and pheasants… The Mighty Elephants, Endorsing their size and statuette upon the island could be seen from a distant and were indeed unfortunately hunted for sport.. Routinely the natives would witness foreign ships crash upon their natural habitats. .. there shores where they indeed lived in fruition for such a long long time…. was met by the occasional idiosyncrasies of the whites who were lured to such islands for game and sport… till this day western whites leave their countries of origin to sport game and havoc in poor native habitat in which the white men abuses foreign territories via complete exploitation, of the habit. 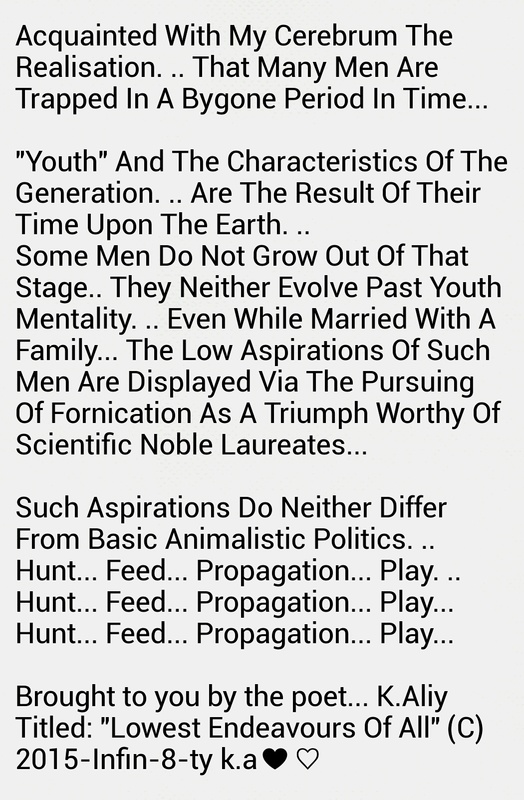 In witnessed history and till this day, such still occur around the world, for the white man’s blood and lust of sport, via game children… animals… easy prey… young under age females… mentally incapable… while the physically incapable are utilised for whatever means of exploitation. .. Unfortunately we also know, that it is 100% as a consequence of finances displayed to the native indigenous tribes around the globe, that each and all become sexual toys of exploitation, child labour, slave labour, game and profit persist! 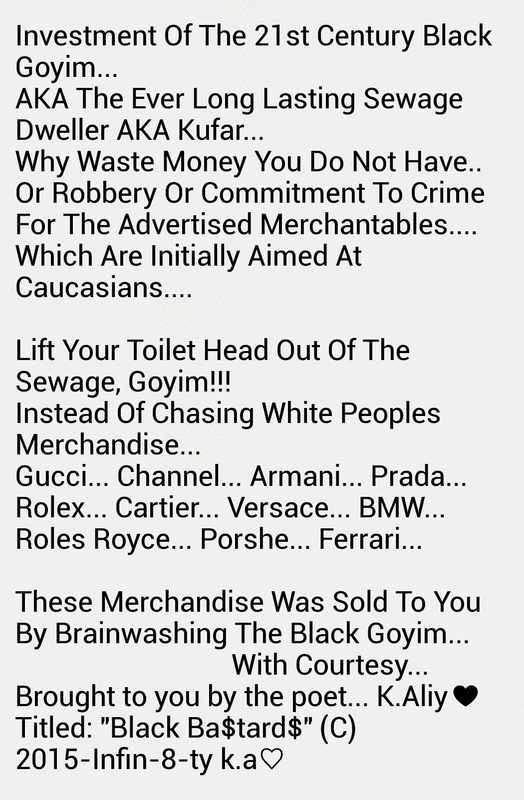 The Caucasians (white people) entice the local native with embellishes of fine wine, jewellery, expensive cloth and materials to subsidise any effort taken by the indigenous tribes… in which the poor tribes are baited into believing the western way is a better way to live then their organic lifestyles… The brainwashing occurs to the extent the natives propagate children in order to gain material substance. The natives learnt the trade of luxury merchandise by the liaisons with the western foreigners. Baby population increased, as interest in children from the western subscription to child delicacy occurred…. As ship crew and travellers knew they was liberally kings in a foreign indigenous land. Law was succinct, in such tribal geographical hemispheres… Western invaders arrived to do as they pleased. Businesses in Sexual exploits with children of the natives, was a casual reminder of the desperation and addiction to a prosperous life. A baby elephant lay lavishing in the mud, rolling and playing… quite comfortable and basking in the heat, utilising the mud to cool the flesh of its mass.. Still only an infant but a substantial size indeed… The baby elephant in its nonchalance to ratiocination… the idiosyncrasies of its euphoria bathed in the mud philosophically. At a side glance it noticed a tiny tail in the mud. On closer inspections a silhouette of a mouse layered with mud relayed to the elephant’s conscience. The elephant took the tiny rat and bathed it by a near by stream. The care displayed by the baby elephant was quite extraordinarily empathetic. Usually elephants and rats were not kindred spirits and negotiates. Adult Elephants were know to display phobias to the rats. 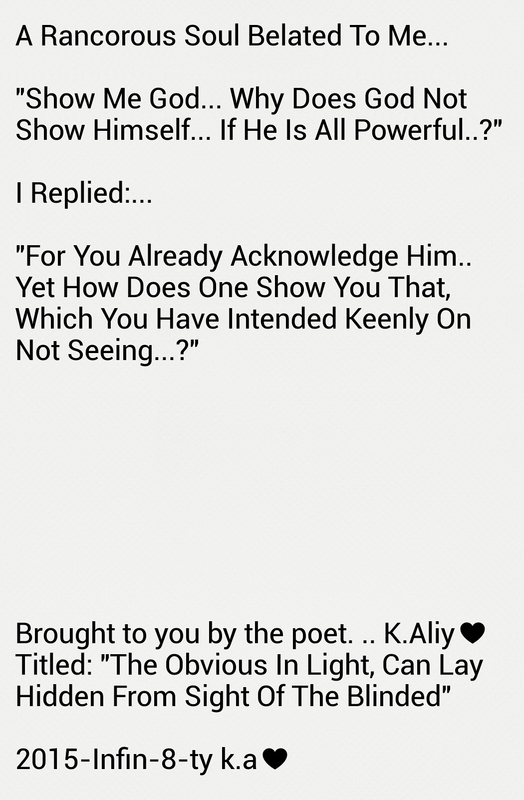 But on such an occasion it appeared the opposite had manifested a spiritual kinship between former companions. After a mourning and several attempts to consolidate life back to the rat by the baby elephant… The baby elephant lay the rat upon a mud heap, the surmounted lump of mud, upon the rats corpse. 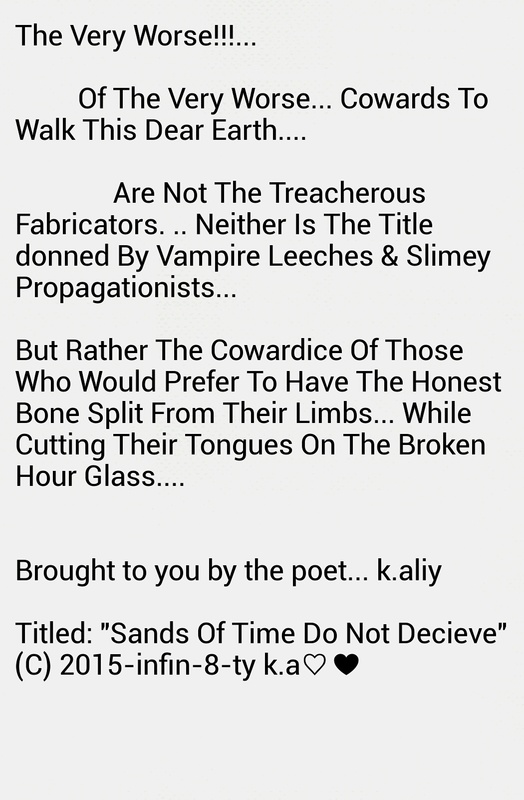 .. as to lay the carcass to rest! As the baby elephant left the area… A small shuffle occured by a bush. Pearing behind a bush, a small rat stood on hind legs peering over the rocks and observing the scenario which had previously unfolded! The rat motioned quickly to the position, the elephant had buried the lifeless body. The rat sniffed, squinted and continued to sniff the ambience around… A few minutes later it was gone in a hurry! 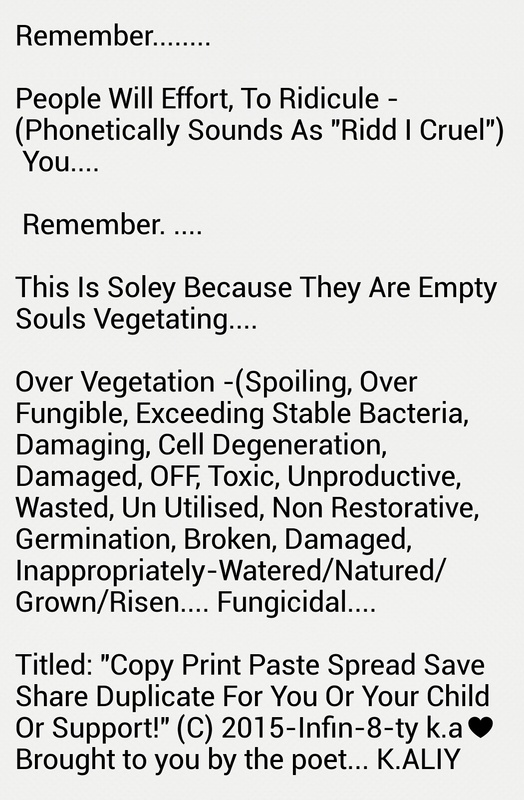 Months past, vegetation grew.. biotic symbiosis. .. protoplasmatic symbolism emerged from slight photosynthesis which branched through near by trees on to the mud splatted zone… The light aided huge vegetation and agricultural forms. Thus changed the landscape and buried the hidden identity of the once graved mud dedicated zone. ..
YEAR AFTER YEAR AFTER YEAR AFTER YEAR….. Sailors came and exploited that which they could… Harbouring tools indistinctive and destructive to the lands of such promise. Such came and took… exploitation was rife. The summers grew hotter and ivory was the gold. One Summer grew distinctively hot, while the western ships roasted across the waves of the Atlantic ocean. A great exploitation was indeed insight, as ships cargo bequeathed great weaponry and sophistication. The ships harboured on the penultimate cruise for much was to return from great hunt. As they harboured, the young children waited and spied upon the equipment offloaded onto shore. Then when all was safe the children would sneak into the sailors camp to play and feast upon equipment which was brought. The sailors arrived at night and new they would have to be up before dawn… in order to comprise the contraptions and devices for hunting elephants. Catch by dawn… slaughter by noon and cargo by evening was the orchestras plans… Early to bed if rise would be met with competences…? That night a crowded group of mature elephants emphatically endeavoured to release there youngest member from the elephant traps… Hours past and the elephants slowly reclined from the zone one by one! 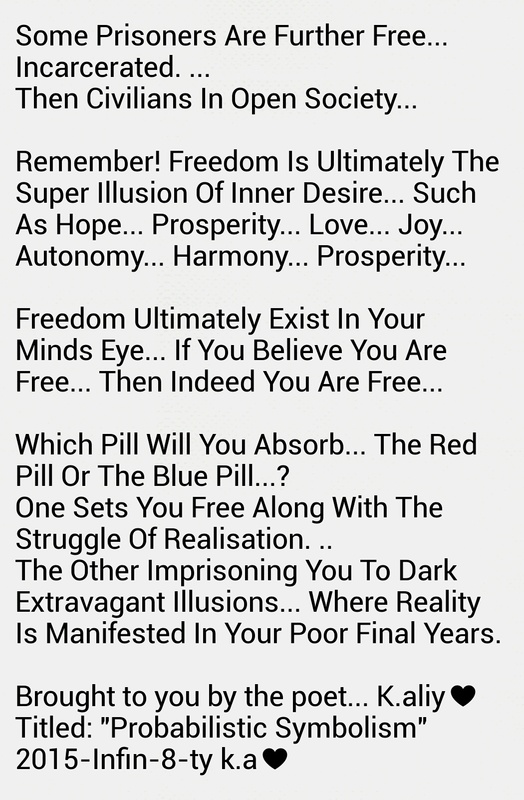 The beneficiary manifested freedom… to the endangered! puzzling… was the scenario, as question inclines a possible rendezvous…? Was rat and elephant reacquainted from a past…? Maybe a seed sowed enabled the others aid! Often in reality such philanthropy is succinct… so succinct often a deploy of trickery and manifested machinability is relayed! Often regulated by the young fashionistic simpletons, who indeed are yet to experience the meaning of life. The young pretentious pretenders, act out poor “Cri De Couers” to the inclining naivety of onlookers… who are indeed, swept, woo… by the audacious performance of a modern protest, for moral support against third world impoverishment. ..
“Why Do I Get The Sensation… The De Javu… The Recollections, That I Have Witnessed This Stage Show Before, Somewhere…? Ahhh of cause… “Hamlet!” To Be Or Not To Be….? What in all seriousness, do modern fresh face brats in loose tongued fancy sneakers, bright clothing and pockets of well being, serious understand about third world democratic demographics….? This is nothing but a mockery of serious incarcerated trauma experienced, by those in globally hostile regions… Modern youth who appear to stand on demonstrations, have as much knowledge and true sincerity in third world crises, “As The Giant Carnivorous Crocodiles Have For Fresh Water Salads With Helmans Tarta Source!” “Disastrously” As that is not there standard recompense for dwelling in such habitat! Better still “The Rolen Rat Crew” guised in gold chains, sneakers and baseball caps who pretend and exhaust such mock demonstrations, merely for the SUBCONSCIOUS Conscientiousness of the dim witted British on lookers, who are taken in by such a hypocritical mass subtraction of ethics behind closed doors.. to the administration of pretend caring for the mere satisfaction of the steady ever empowering EVILITY with in the genetic make up of the European genome! For this, I declare, who are you fooling again but yourself… everyone is aware if how much the west hates foreign policyholders etc…. yet one has to question their reason for such an extravagant bystand of crues for fairness in foreign lands, while simultaneously abusing foreign migrants and ethnics under their own care and in the british lands. ..
That will not work out for you.. Unfortunately! 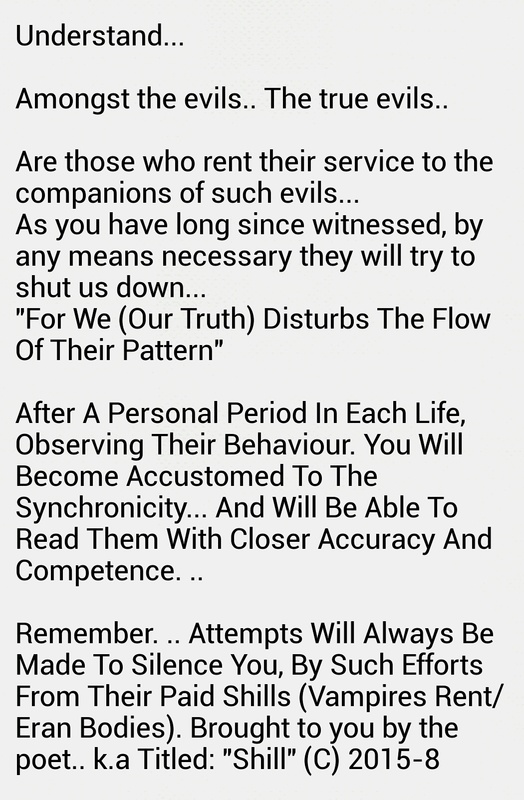 The torment and cancerous cells that are steady waiting for such characters are only but the beginning… Just as individuals and groups have belated much evil… also have chosen their personal subscription to such fates! 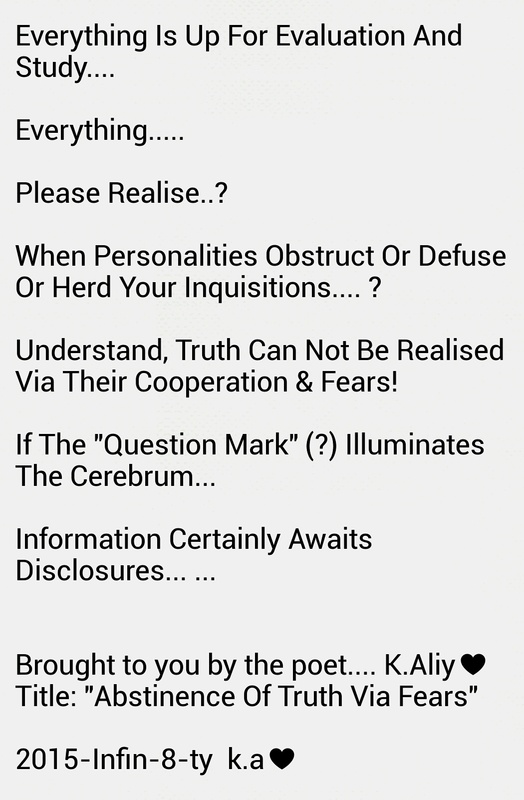 All in all every actiin deserves reaction. . regardless of perception or innocuous innocents in mind, for often a front row ticket at monitored slow cancerous demise… often baits such hate! We await your court proceedings, such courts that can neither be bought by dollar, pound or subsidiaries. ..
Court of the cosmos… the benevolent the sublimation! In This Affirmation And Continuing On From The Previous Affirmation here, In “Autonomy, Catastrophe And Trauma”… Hopefully We Can Delve Further With More Precise Inquisitions. Also…! 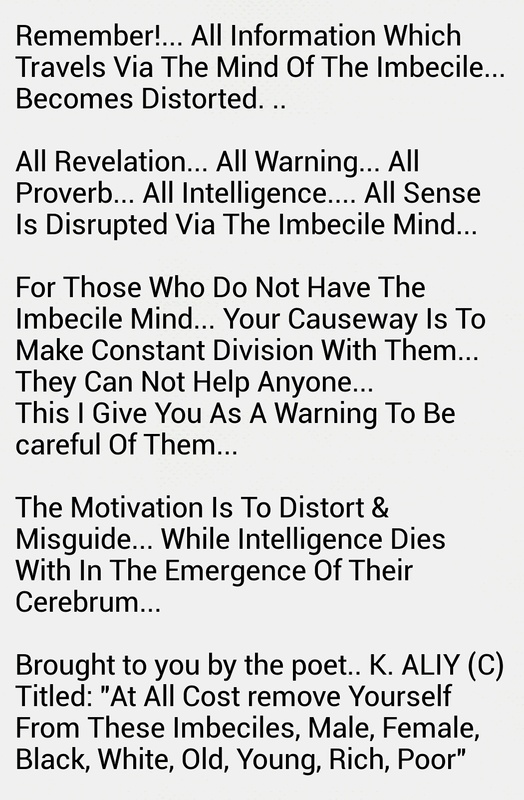 Understanding, These Chapters Are Never And Not For The Most Ignorant Of cerebrum Or Easily Offended…. 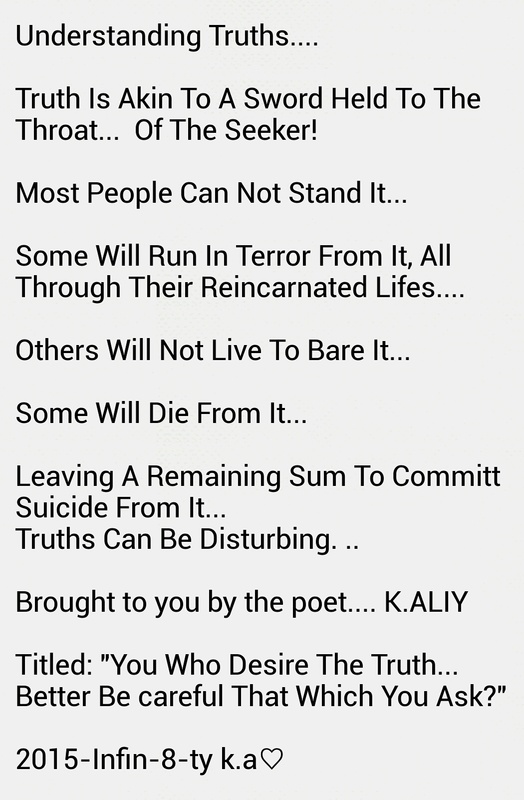 Hopefully, If You Have Been familiarising In The Early Blogs At This Website Http://khalilaliytheenlightenmentbomb.wordpress.com You May Be Now familiar With The Affirmations We Have Been Sharing Here… If You Have Not…? Well! Need I Explain More…? 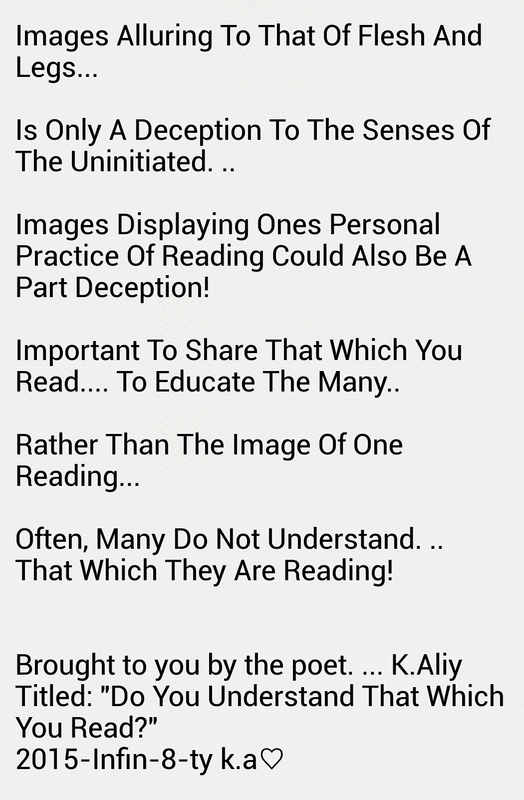 You Are Probably Not Ready For That Which We Are Sharing!.. 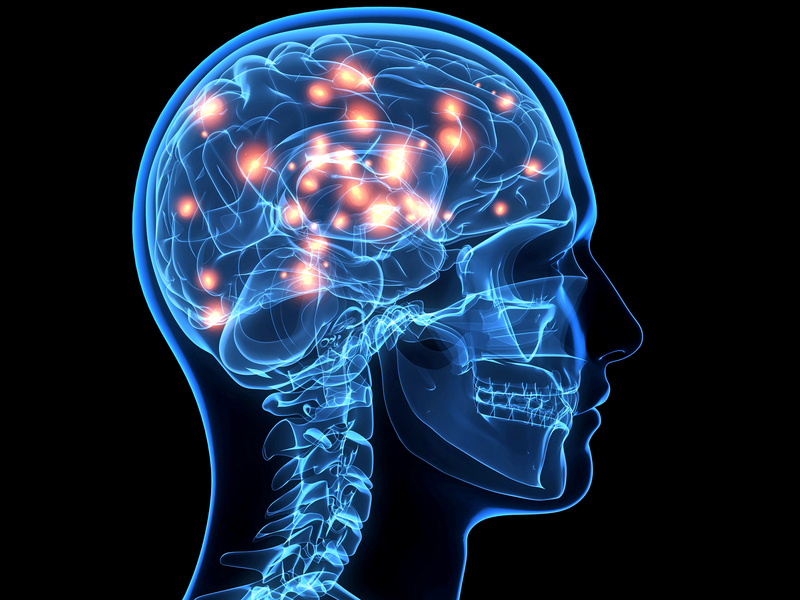 Also, Also understand That, Each Individual Cerebrum Evolves At A Separate Rate, Plus The Fact The Intelligence Quotient Fluctuates Between Each Individual In Their Personal Stage Of Civility… To Autonomy Via Traumas -(The Individual Experience Of Trauma, Catastrophe And Autonomy). 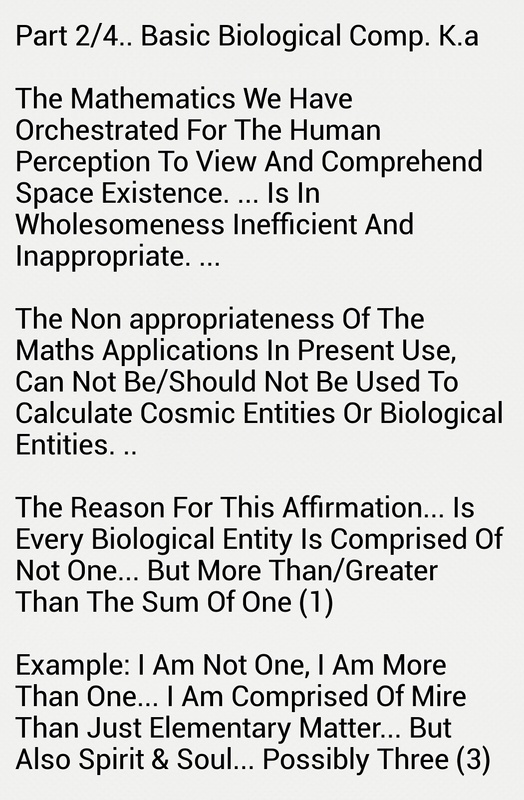 As We Discussed In Previous Chapters Here, Such Affirmations Can Not Be Discussed, Deciphered And Delivered Enough, Especially Once You Have Finally Understood The Demographics Of Existence, The Personal Premise And Our Relation With In/Out!… This Becomes All Very Simple, Indeed! The Greatest Gift To Life Is That Of Trauma, Abuse, Affliction, Pain, Misery, Emptiness, Victimisation, Misanthropy, Debilitation, Agony, Hurt, Mistreatment, Transgressions, Oppression, Suppression And Depression! 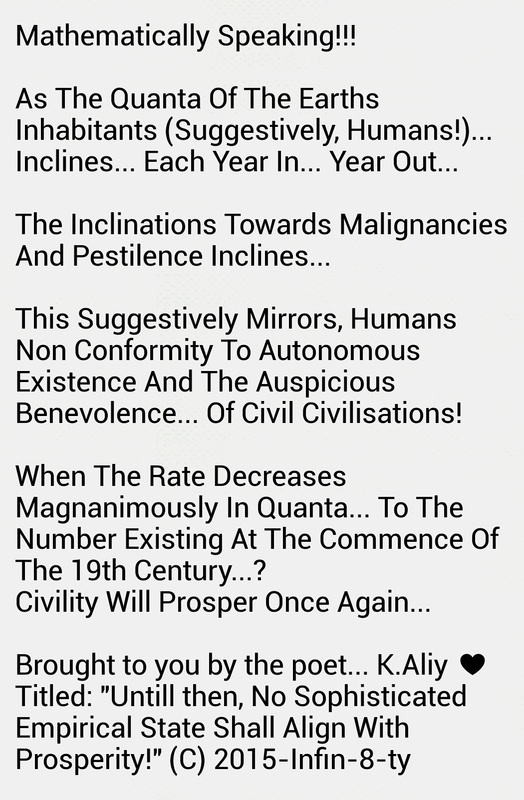 All These Necessary Evils Are That Which Has Aided The Civility Of Mass Modernisation And Self! Without Such Affliction…. Understand, That Neither Empathy, Patience Would Neither Exist. .. You Will Recognise The Fact That, Humankind Evolves Into A More Advanced Restorative State Of Autonomy And Fairness When Humanities Bystanders Become Afflicted With suffering… Understanding This Affliction, Which Is Bequeathed Upon Humanities Individuals, Is Never Internationally Synchronised. You Should Be Aware, Emotions Are Not Internationally Linked. What We Mean Here Is, As Each Individual Becomes Aware And Are Alerted To The Problems Of Life, They Usually Become Empathetic. .. The Only Problem Here, Is The Fact Of Two Very Important Facets! No.1 When Person A Or Group A Has Become Self Aware Through The Experience Process Of “Trial And Error”, Usually Person B Or Group B Has Long Yet To Experience Such Important Realisations. … This Allures… For A Difficult Understanding Between The Two Sides! As One Side Is Educated The Other Side Has Yet To Fathom, Un-apathetic Position, While The Superior Evolved In Civility Are To Patiently Await The Progressive Civility Of The unawares And Un-Evolved! Yet The Importance Here Is If There Was Constant Autonomy, What Would People Learn… Throughout Their Life…? 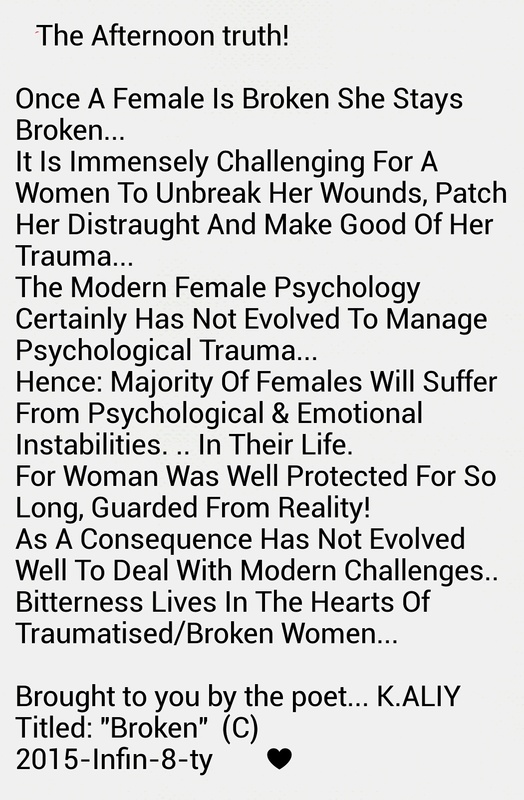 Unfortunately It Is Also Evident, To Acknowledge, Most People Do Crash And Burn, Often You Will Find Children Following In The Steps Of Their Parents… Who Are Often “Highly Uneducated”… Often Poor Lying Damaged Mothers Or Lonely Women Do Not Evolve Well, That Have Previously Been Hurt Or Heartbroken, While…. Indeed Pass On All Affliction Inherited To Child Or Another Who Falls Upon Their Web, And Into Avenues Which Will Not Support Autonomy And Happiness… Ever In Longevity. .
You Will Notice For Example, Love Partners, Who Do Not Share The Approximation In The Department Of “Individual Quotient”… Often Struggle With All Long Term Decisions And Major Factors Illustrated In Guide lines, Of The Registering Successful Partners In Longevity! To Equate With The Superior Monophonic Substance, Of Such Success, In My Search I Have Discovered That, Strangely Enough, And Above All Things, Individual Quotient Registers As The Binding Force Of Such A Programme! Hence, Like For Like…. Often This Mediation, Is Lost In Other Areas Which, Are Forged In A False Abode, Detailed. Such, Never Truly Fulfil The Earliest Impressions. .. Finances Is Also Quite A Necessary Evil In A Partnership Securing Guidance Between Any Union… As Is Moral Virtue And Health. .. The More Independent Similarities Unions Have The Ever Stringent The Binding Bond… Often Wealthy Individuals Partner With, Aesthetic Or Youthful Individuals. .. Unfortunately And More Often Do Not Blossom Into lengthily Autonomous Relationships…… Yet If The Individual Quotient, Is Measured Equally You Will Often Witness A Fare Autonomy, Even If Multiple Differences Exist…? 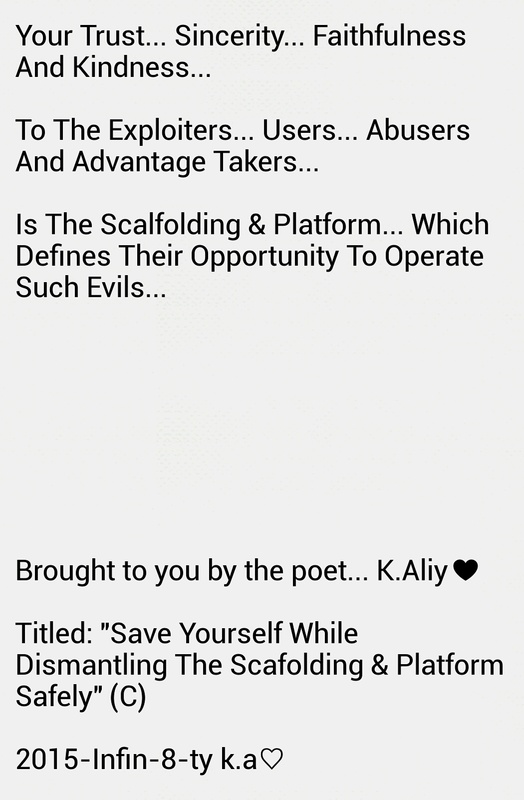 Such Dear Enlightenment, Is Profanely Indeed Necessary, Pitched As The Ultimate Binding Blocks Between Peers/Unions! This Is Amongst The Differentiations In Societies Around The World… The Learning Curbs Are Constituents Of Individual Growth And Evolution Per Person… Per Peer… Per Life! And Indeed Such A presentation Is Realisation Apprehended. ..
That Which I Have Realised, Is Via Peoples Personal Testament, They Became Empathetic, And Without It, They Could Not Have Been.. 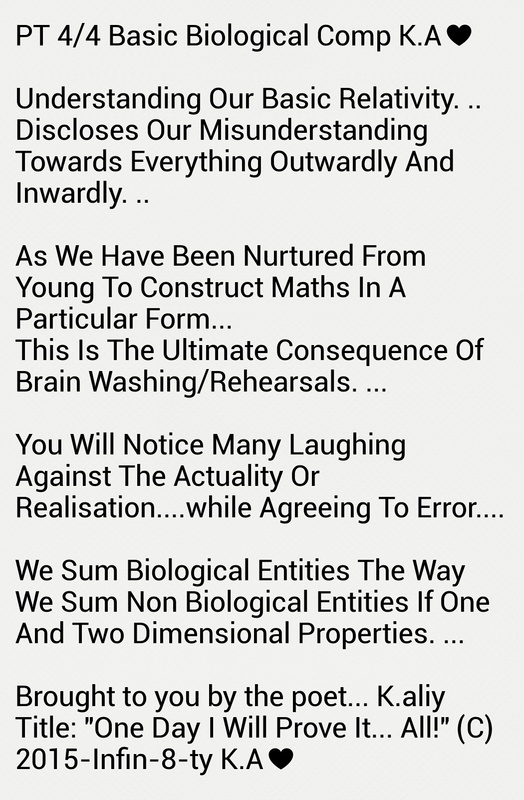 This Monolithic Aclimatisation To Actuation… I Am Also Trusting Of As Precise Accountancy Of Existence. You Should Never Ever Trust A Human… Under All Accounts… But Ultimately Only Each Soul Can Truly Decide When Realisation And Enlightenment Are Bequeathed, Who, When, Why, With… Etc… Nobody Can Decide For You… As Daily Many People Around The World Have Their Life Ruined By Others Deciding For Them…You May Have Realised, That I Stated Enlightenment… Because As I Believe This Is Bequeathed From A Higher Echelon To The Soul… Instead Of… From The/A Particular Soul Or Recipient To The Self/Recipient! 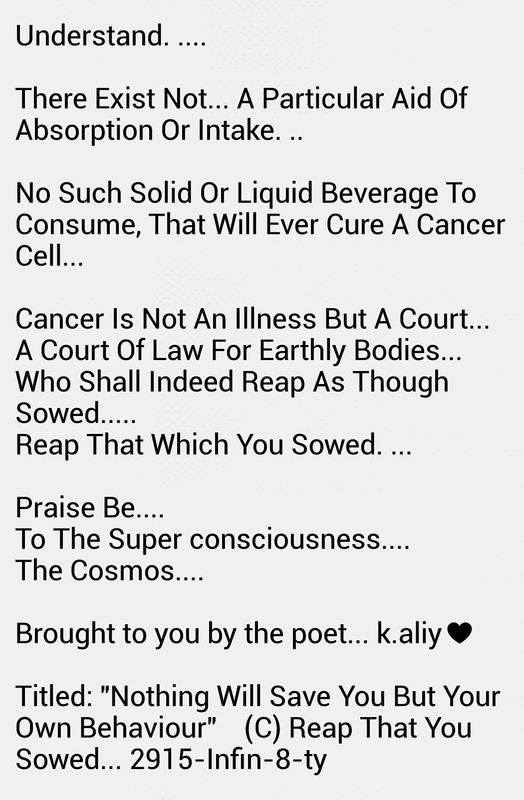 Now You May Have Understood, Why I Am Saying That Cancer And Disease Is A Blessing In Disguise For Humanity. 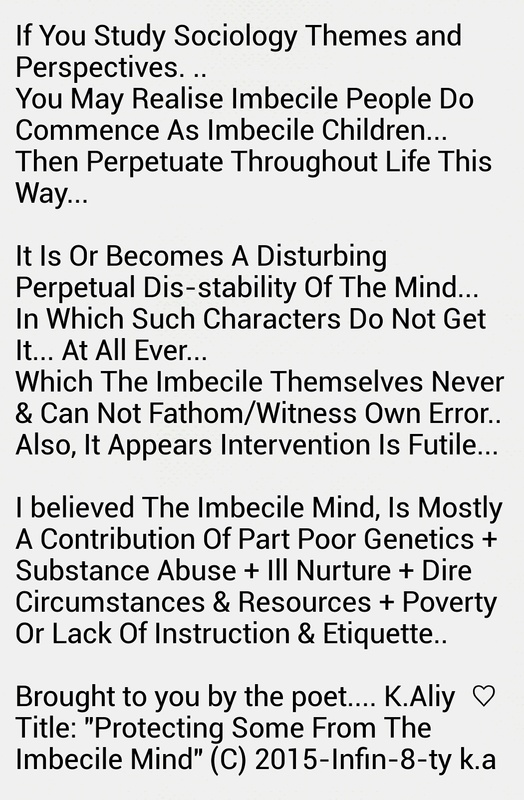 .. As Without Such Debilitating Afflictions, Empathy And Reasoning Would Never Survive In The World Of Nonchalance And Mild To High Ignorance! 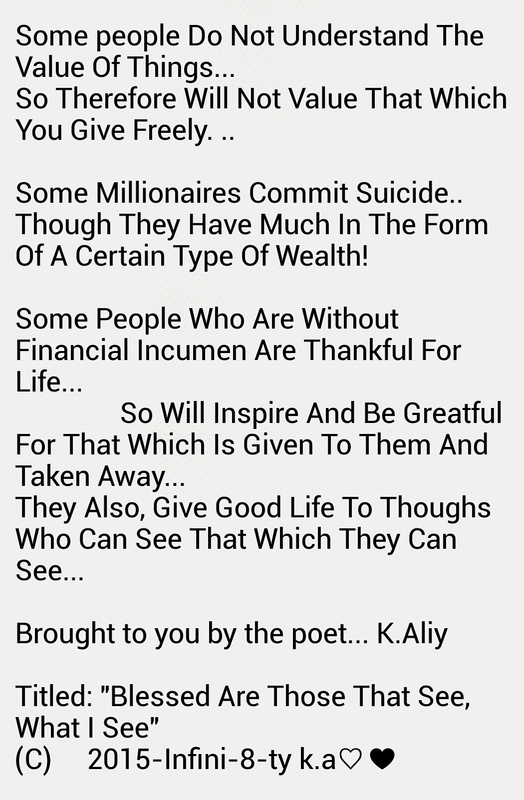 Death Is Also A Very Blessing And Necessity, As Humans Are Often Obtrusive Upon The Environment Earth As A Whole…. 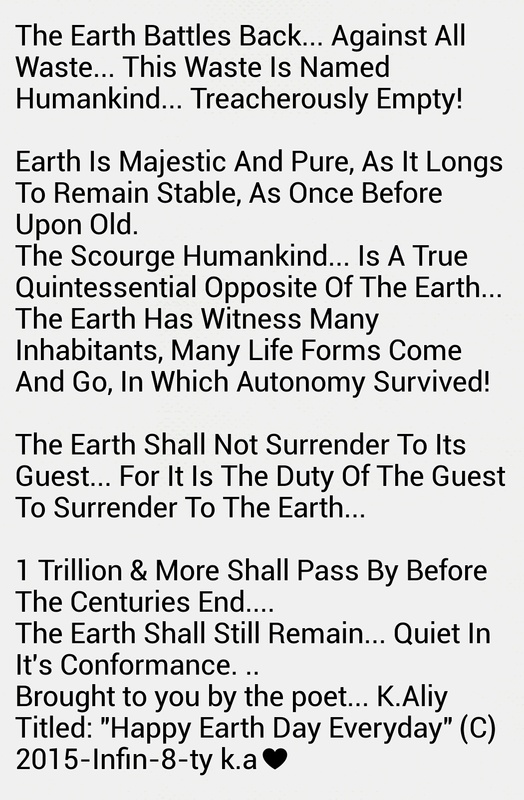 We Can Affirm Humankind Has Completed More Destruction In The Past One Hundred Years Of Human existence… Than The Complete Numeration Of All The Other Life Inhabitants Upon Planet Earth Since The Beginning Of Earth! This Is Why I Believe We Should Celebrate Death And Trauma… In Which I Propose A Happy Death And Trauma Day Every Week!! 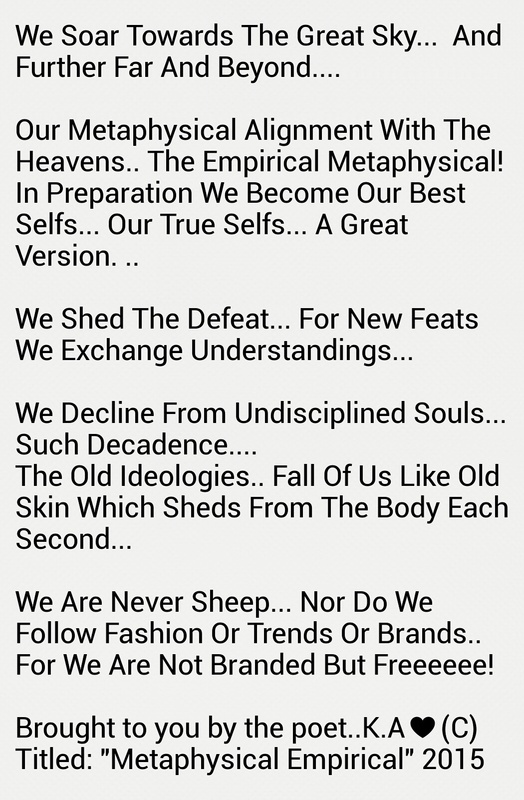 For The Supreme Power That Be… Is Never Wrong!.. Without Enlightenment… The Question Is.. What Is Humanity Without Enlightenment. …?